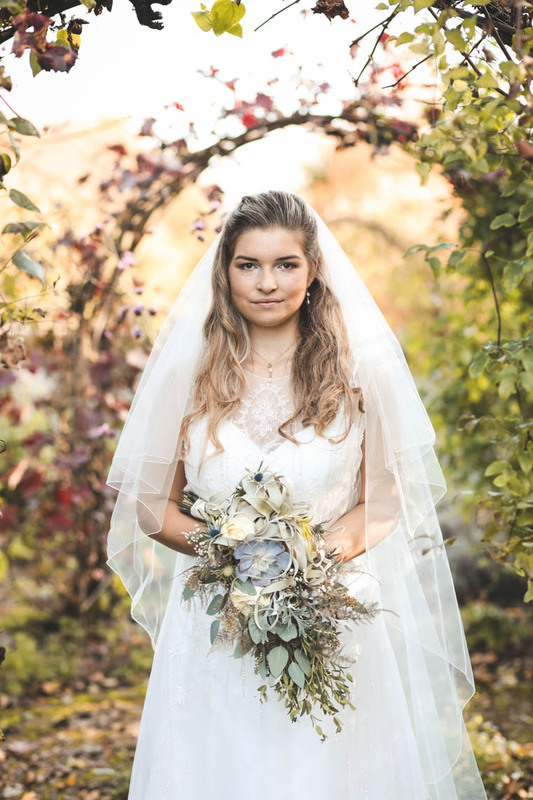 Following the success of the recent Secret Garden and Journey to the Centre of the Earth bridal styled shoots, Hanami Dream are proud to announce their next styled shoot for spring time this year. 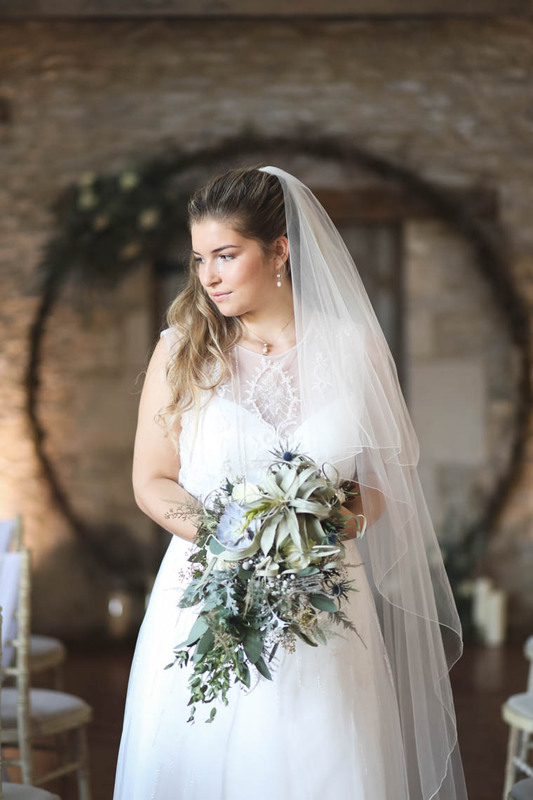 The shoot is planned for this spring in the Oxfordshire countryside of the Cotswolds and I’m excited to offer the opportunity for local suppliers to join with me. 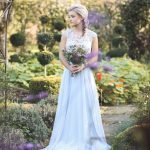 So let me know if you’d like to provide products to bring my creative ideas to life in a wonderful new inspirational shoot. 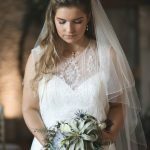 The beauty of styled shoots (versus a real life wedding) is that this is your opportunity to be a little more extravagant and really show off what you’ve always wanted to do. 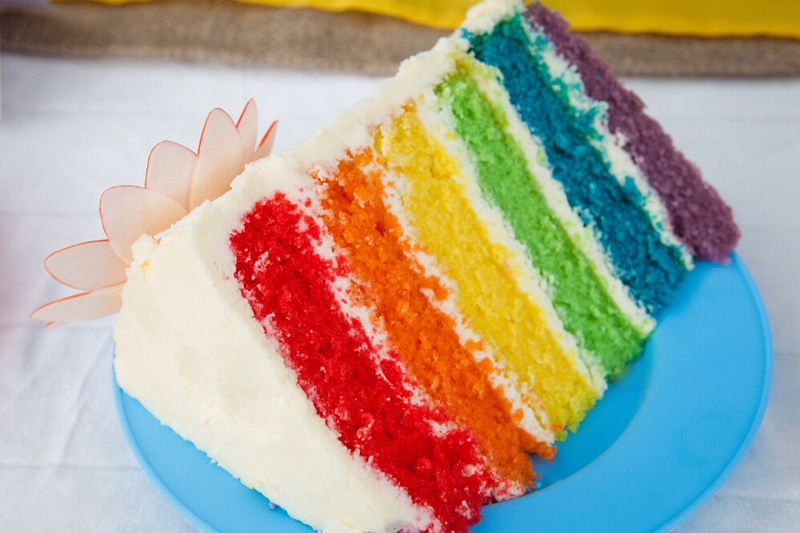 You can indulge your fantasies. Maybe you’ve got a new product that couples won’t have seen yet or you want to create something really unusual that you wouldn’t normally do. 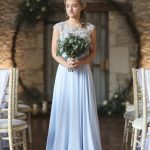 Styled shoots are a collaboration of like minded people that can create great things together but perhaps don’t have the budgets to produce this kind of work if they all worked independently. 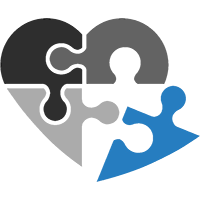 Everyone works pro bono, so it is just your products that you’d need to provide to be involved. 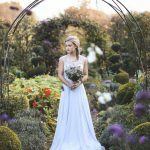 Nicola from Hanami Dream organises and styles the shoots. 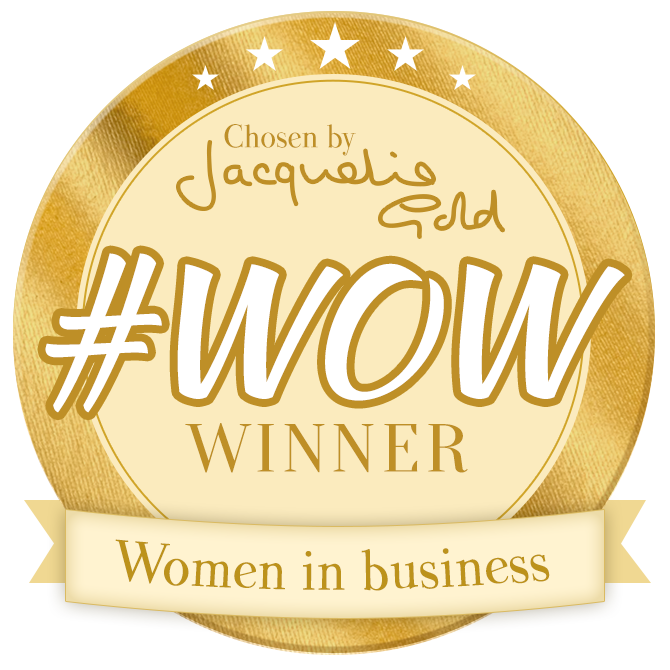 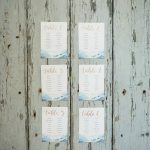 And the rewards are amazing with great imagery of your products in an amazing lifestyle surrounding, plus inclusion in all my promotion of the shoot and a feature on Hanami Dream’s blog, which is a UK Blog Awards winner in 2018 and wedding judge of the UK Blog Awards 2019. 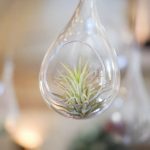 So there’d be plenty of exposure of your beautiful products. 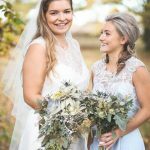 Hanami Dream styled shoots have been published in Bride Magazine; Your Glos & Wilts Wedding magazine; Your Berks, Buck and Oxon Wedding magazine; SoGlos Weddings. 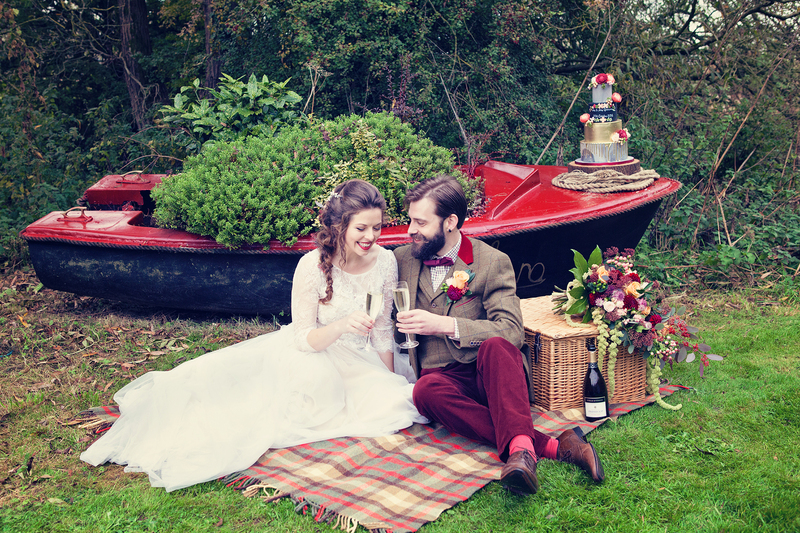 My shoots bring together wonderful local suppliers. 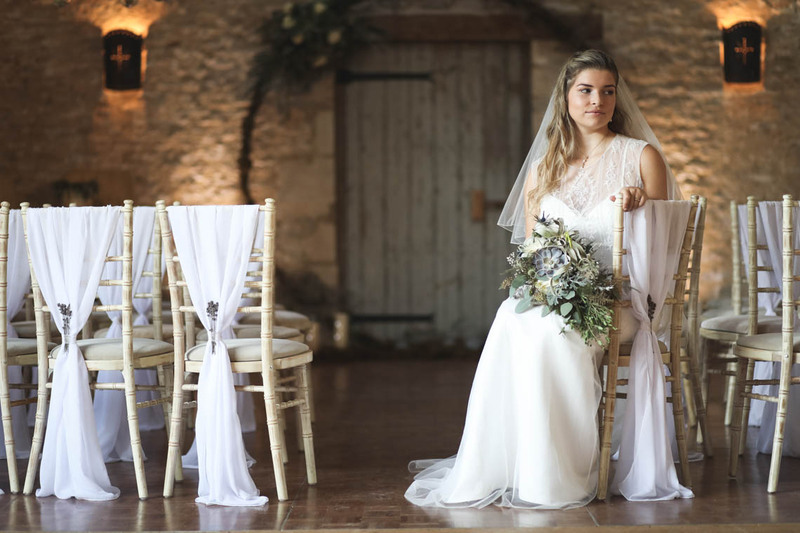 Together we showcase the amazing talent that our part of the UK has to offer the wedding industry and all benefit from the lifestyle imagery and promotion. 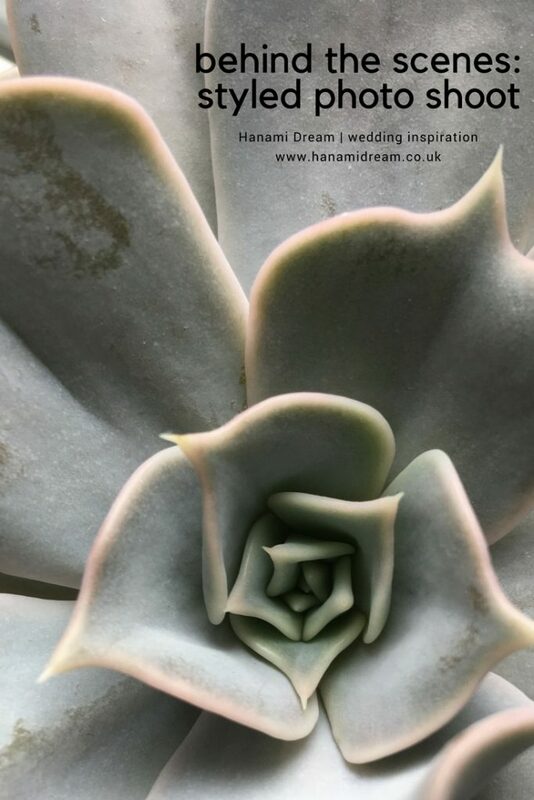 If you’re local and are interested in showcasing your products in my next shoot then please email Nicola from Hanami Dream and outline what your product is and how you think it would fit in and enhance the theme. 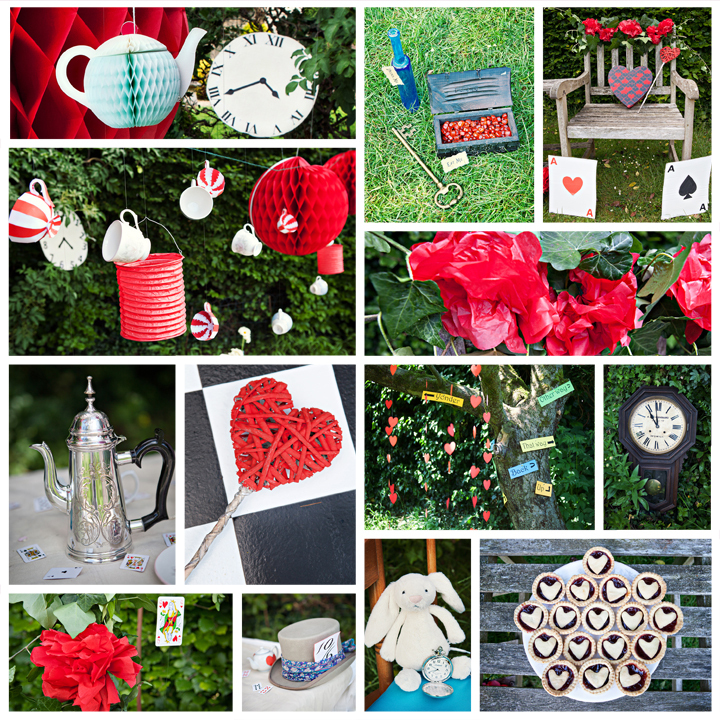 I’ve put together a mood board I can share if you want to get an idea of the kind of things that I’m after. 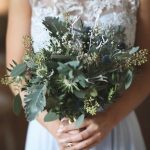 I’ll only be including one supplier from each category (ie only one florist will be used for the whole shoot) to provide clarity and clear communication. 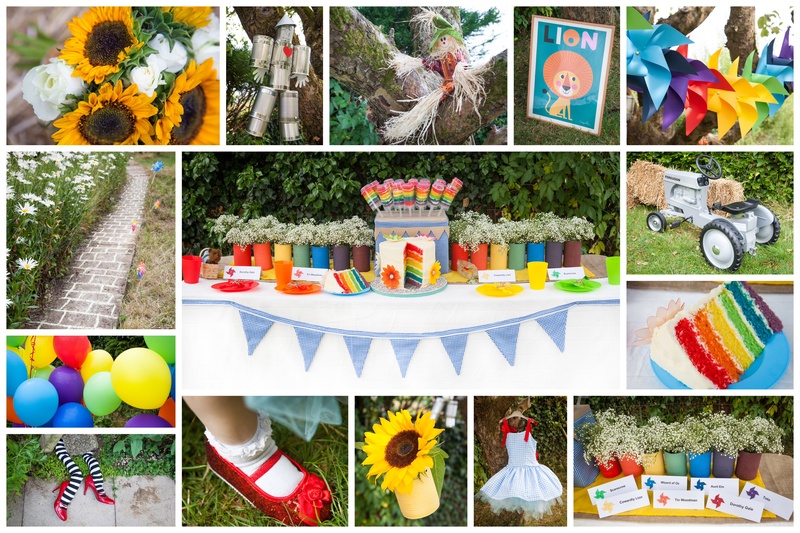 You can see from my previous shoots that I really like close up detail shots which show off everyone’s products very nicely – it is all about the little details that bring any event to life. 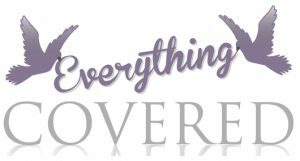 I look forward to sharing more news as plans unfold for this collaboration. 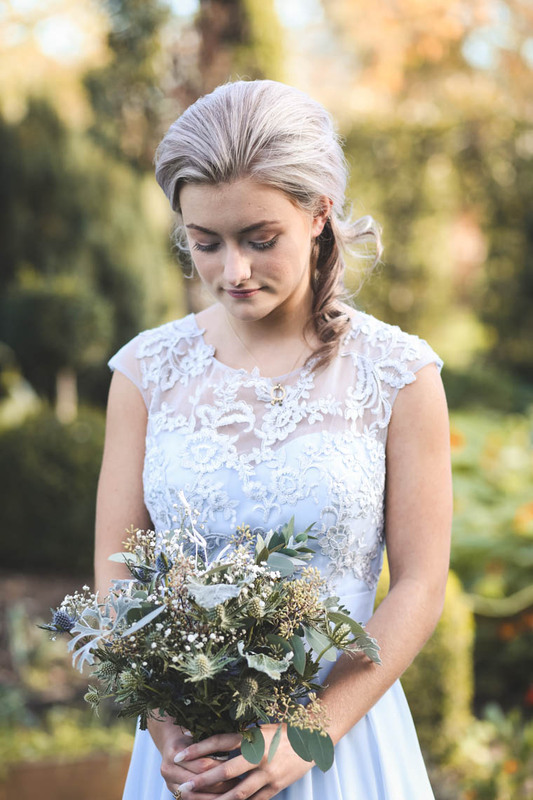 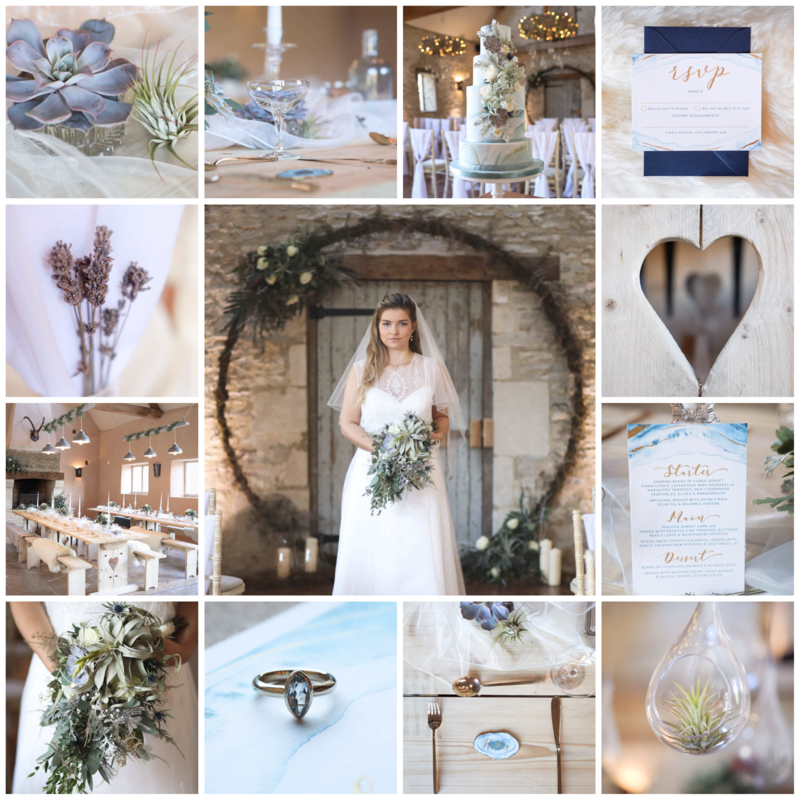 See more images in our gallery and the amazing local suppliers who came together to make this shoot possible in this blog post. 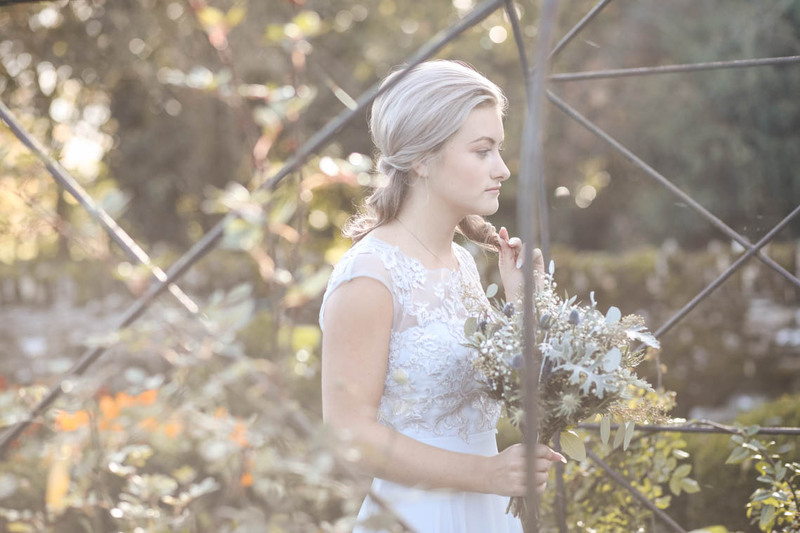 Here’s a look behind the scenes of one of my recent styled shoots. 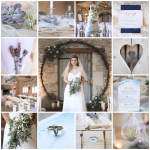 I was over the moon to be approached by a beautiful local venue last year (via a great photography partner) to style their wedding venue in order to show it off in a new light and provide all involved with wonderful lifestyle imagery. 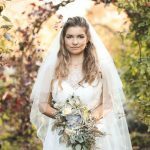 It was wonderful to work alongside Steve from Squib Photography again (we previously worked on another styled bridal shoot last year). 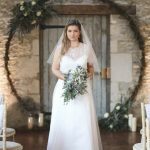 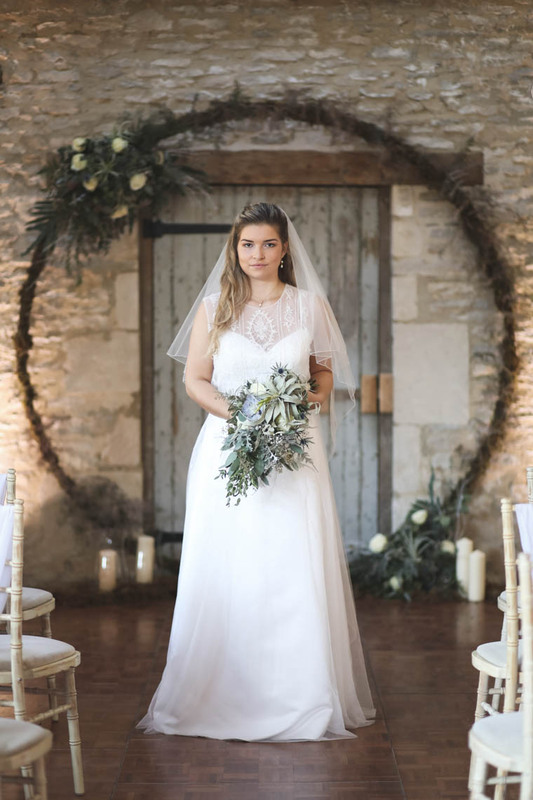 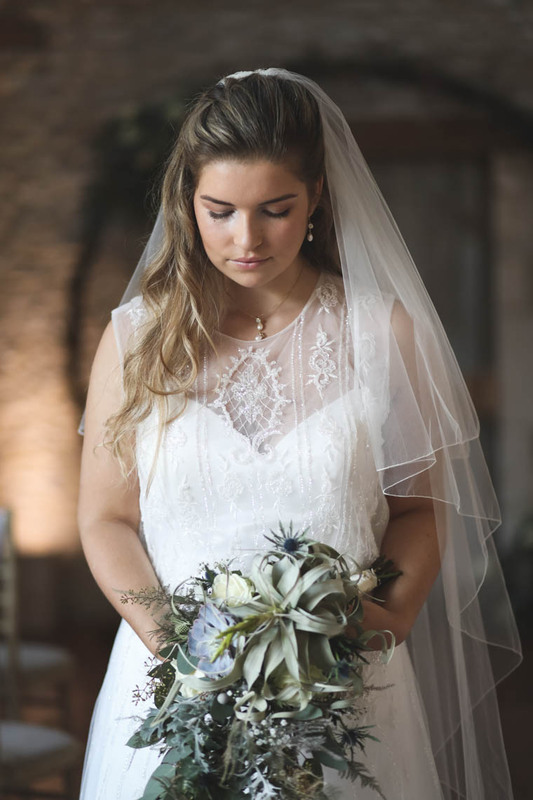 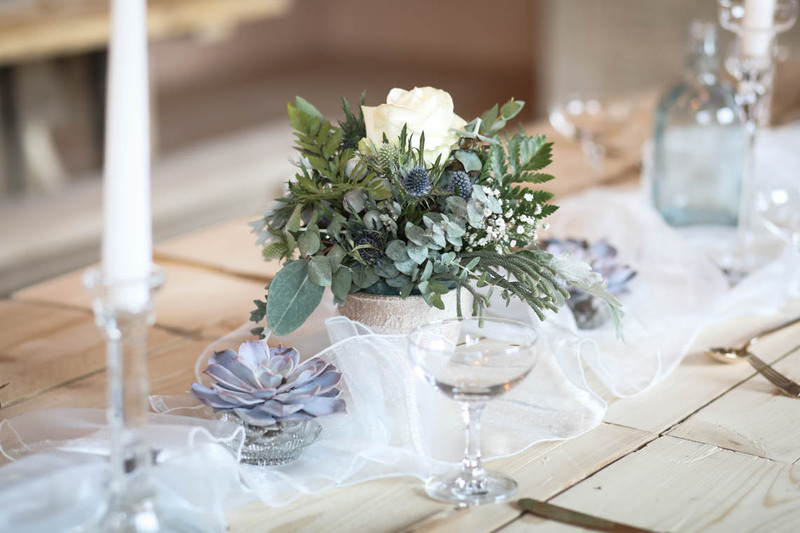 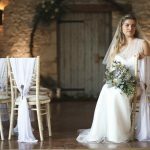 This time we were at Oxleaze Barn and we collaborated to produce an amazing bridal styled shoot inspired by Journey to the Centre of the Earth. 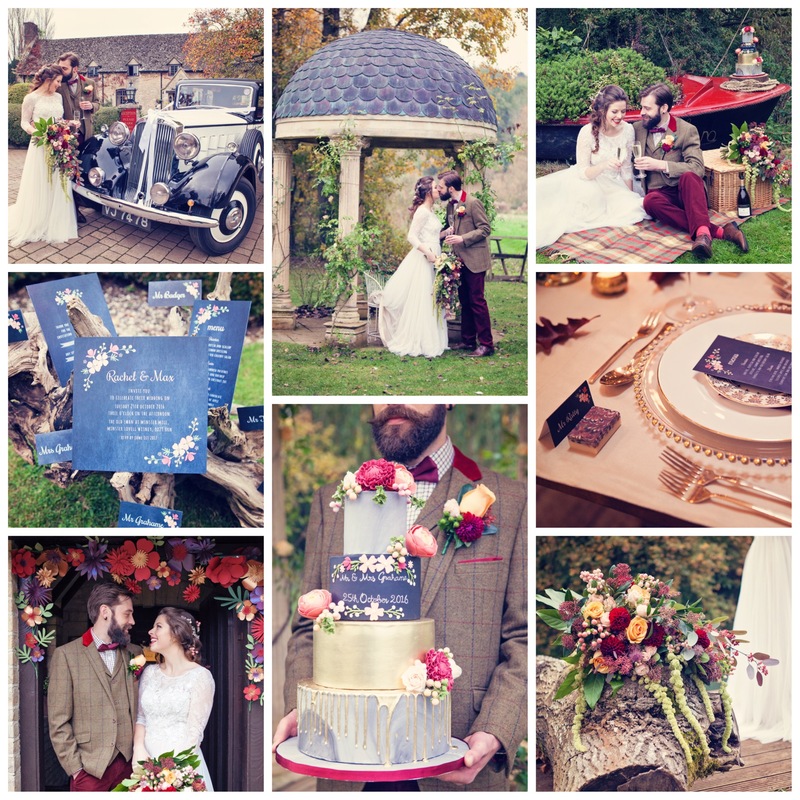 It was also a privilege to be able to showcase some amazing products from some fantastic local suppliers. 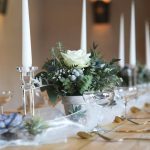 I always have a number of ideas swilling around inside my head that are waiting for the right venue and season to utilise a certain theme. 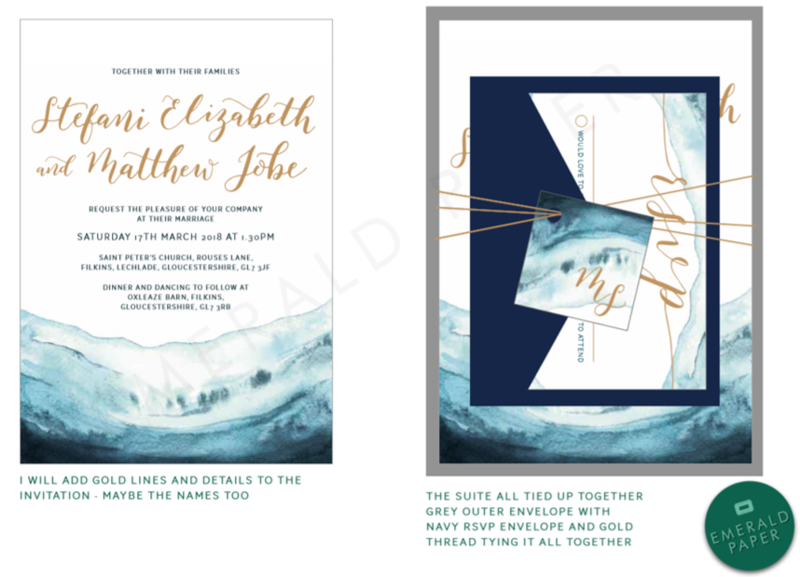 I’d had this particular theme in mind for a while and it had evolved and I had time to mull it over a long time before I’d even visited the venue for the first time. 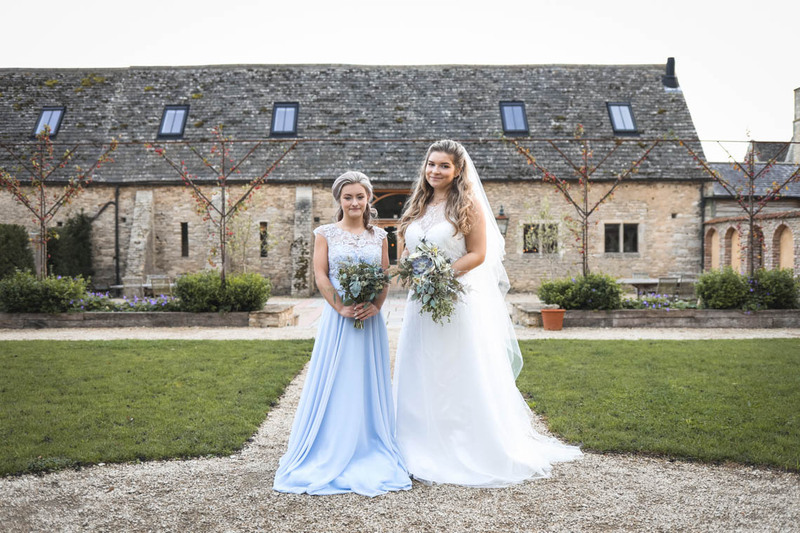 As soon as I saw Oxleaze Barn, I noticed all the blue accents around the 1700s barn and farm, so I knew that this theme would work perfectly there. 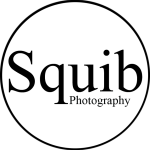 Journey to the Centre of the Earth by Jules Verne (published in 1864) features an expedition to Iceland and exploration through volcanic tunnels. 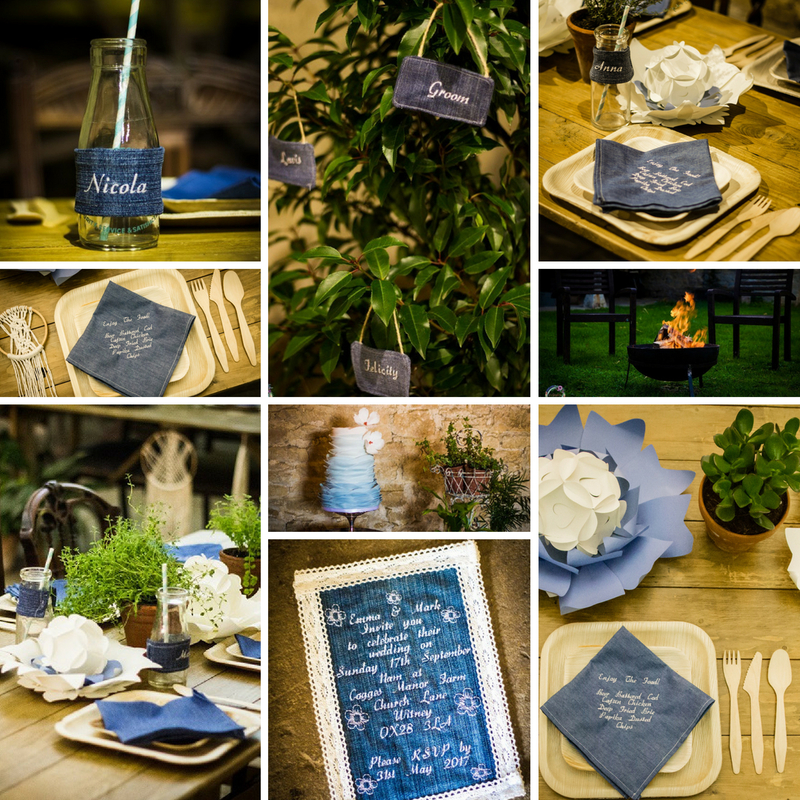 (See some of my previous styled shoots based on other classic books.) 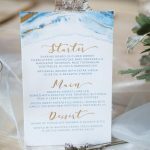 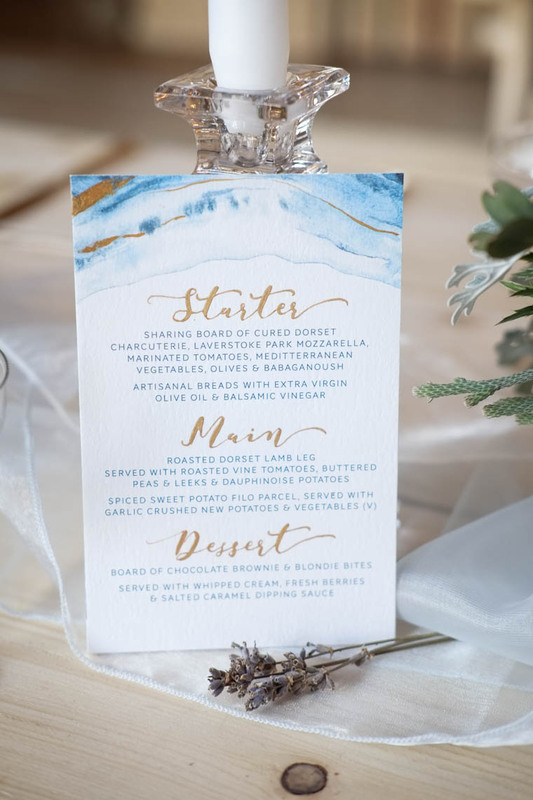 The Icelandic edge took me to cold, icy places and this wintry theme seamlessly fitted a modern winter styled barn wedding. 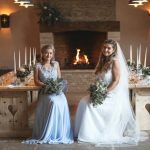 I especially wanted to emphasise that this wedding venue was available year round, thanks to their underfloor heating, and wanted the images to exude warmth and play on the hygge trend with a relaxed and intimate vibe. 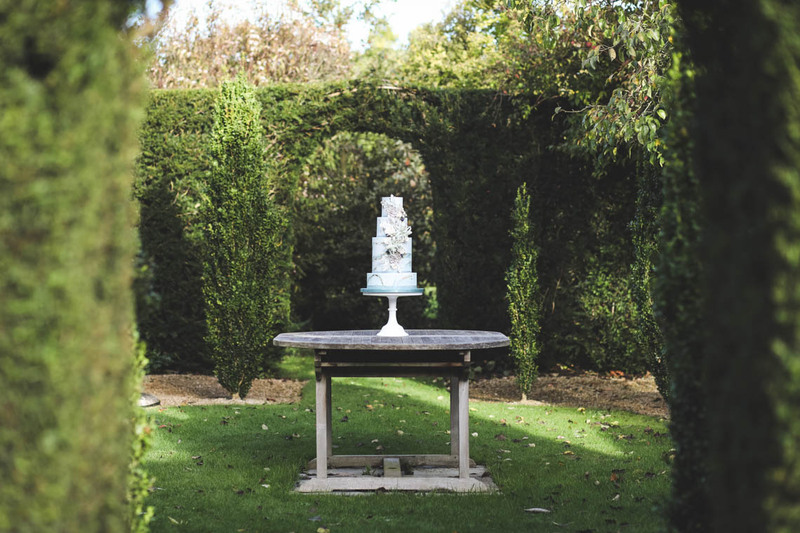 Plus it was great to have the opportunity to showcase the evergreen and expanse of their garden. 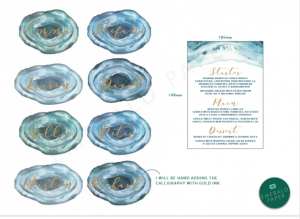 I also wanted to include nods to the book with the inclusion of volcanic rock themes through slick agate, intricate hollow geode or timeless marble. 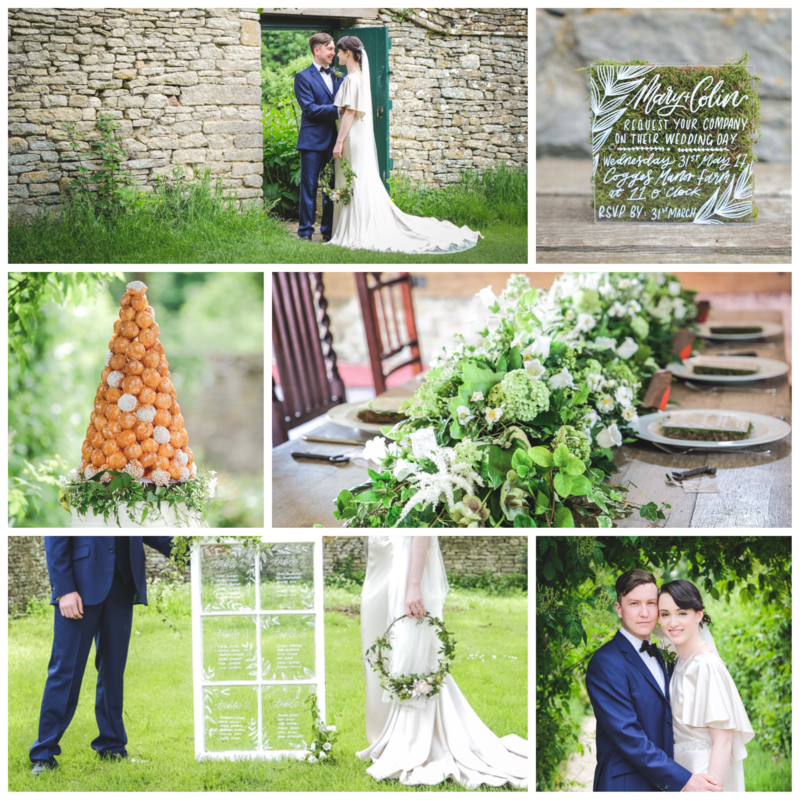 It is really important to me that my blog creates wedding inspiration in the beautiful Cotswolds. 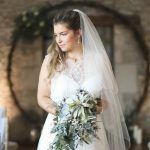 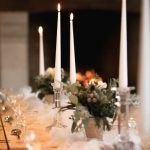 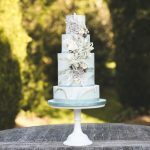 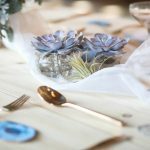 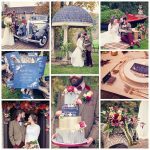 The uniqueness of the blog comes from showcasing my own beautiful and inspirational, trend-led styled wedding shoots, collaborating with local venues and innovative wedding suppliers. 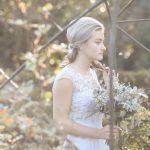 Before starting Hanami Dream in 2014, I worked for over 6 years for an international clothing brand where I planned and managed photo shoots in some fabulous locations around the world. 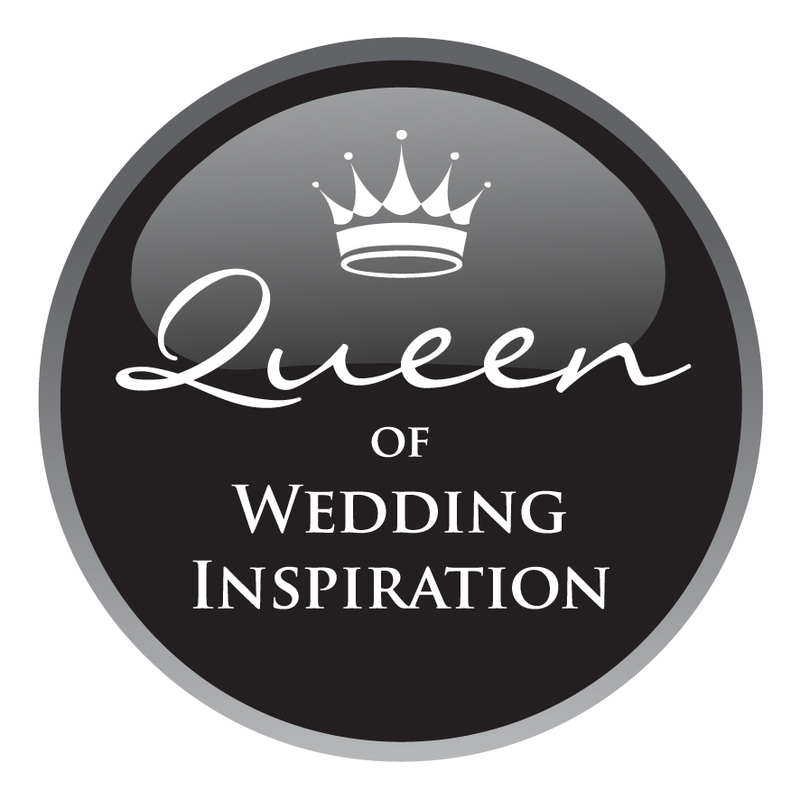 Now I get to combine my wonderful experience with my passion for weddings whilst supporting local businesses. 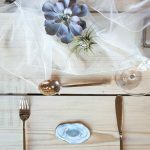 A styled shoot takes almost as much time and effort to produce as a wedding day and entails bringing together everything from many different suppliers. 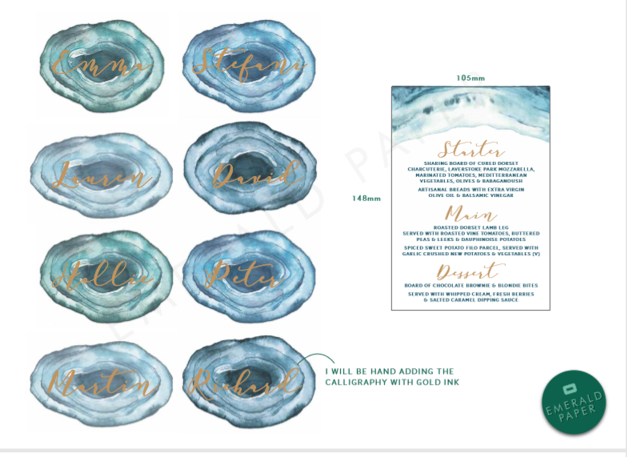 For me the process always starts visually. 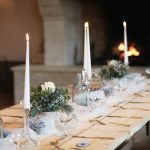 Firstly on Pinterest where I collate my thoughts, then secondly on paper where I sketch out a floor plan, each scene and how every element will come together on a tablescape. 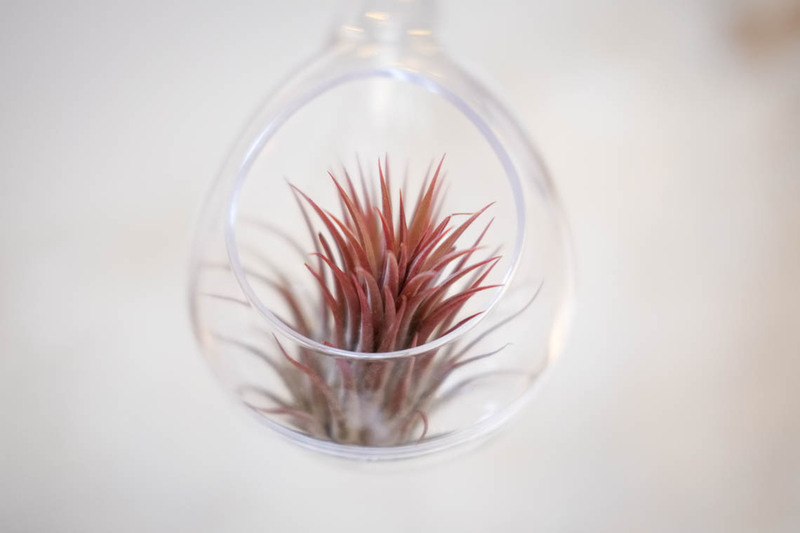 Sometimes I have an idea of a product and I search for the best local supplier to provide that item. 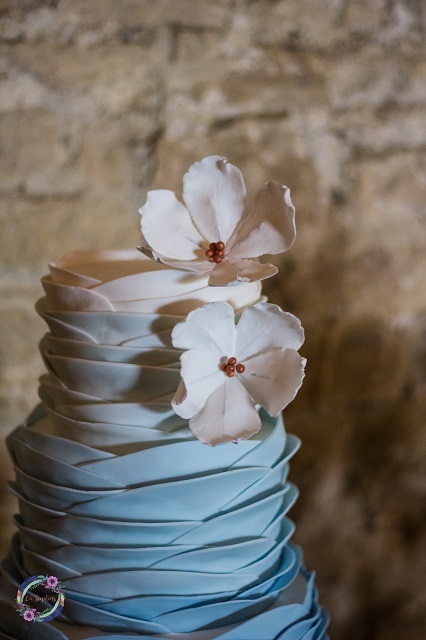 Other times, I see something that someone has created and I file it away for the most suitable shoot in the future. 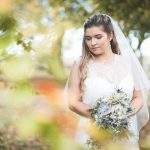 The beauty of styled shoots (versus a real life wedding) is that it is a great opportunity to be a little more extravagant and really show off what you’ve always wanted to do. 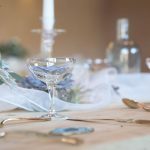 You can indulge your fantasies with new trends or products that couples may not have seen yet or something really unusual. 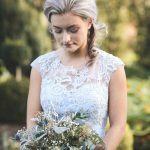 This styled shoot was a collaboration of like minded people that created great things together but perhaps didn’t have the budget to produce this kind of work if they all worked independently. 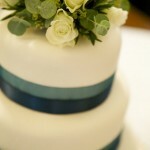 And most importantly, the suppliers I used are all local to the venue. This means that for anyone planning their wedding at this venue, this look and feel is completely achievable and realistic. 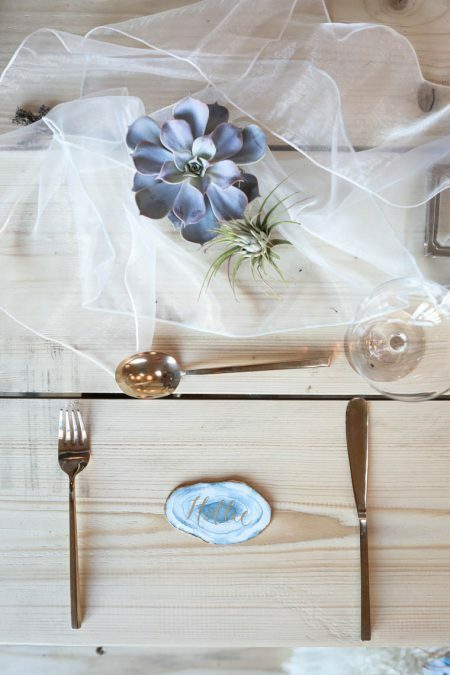 The images might be Pinterest worthy but they are not unattainable. 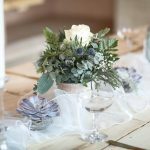 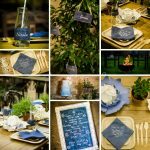 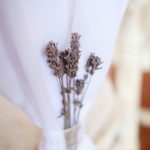 Whether it is a styled shoot or a real life wedding day, the key is that each event is personal and tailor made. 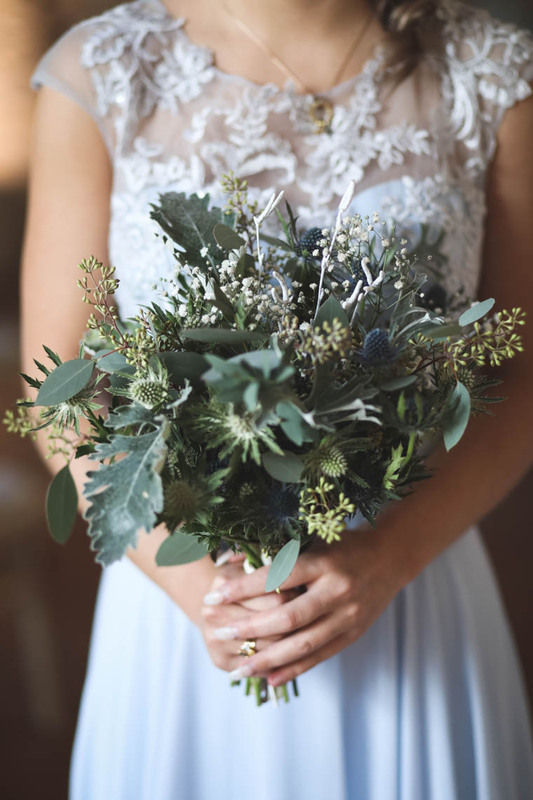 We are very lucky to live in a beautiful part of the UK and are surrounded by some seriously talented wedding venues, professionals and suppliers. 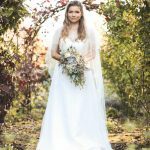 It was brilliant that so many wanted to be involved in this shoot and they certainly didn’t disappoint with the products that they provided. 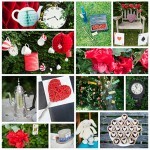 I also provided them with my collated vision and ideas on my Pinterest board. 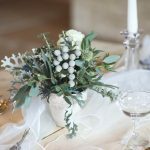 The creative suppliers worked wonders in transforming my overflowing pot of ideas and pairing it down in to realistic and achievable products for us to showcase. 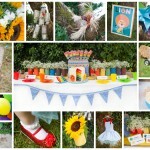 Usually each shoot starts with a muse or product that sparks the theme and everything flows from that element. 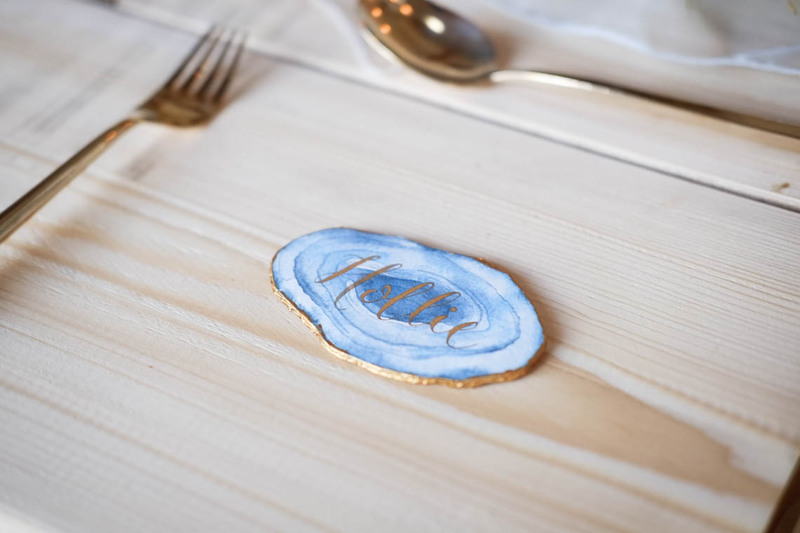 For this shoot, it was some marbled concrete pots, concrete coasters, concrete letters, and concrete table numbers. 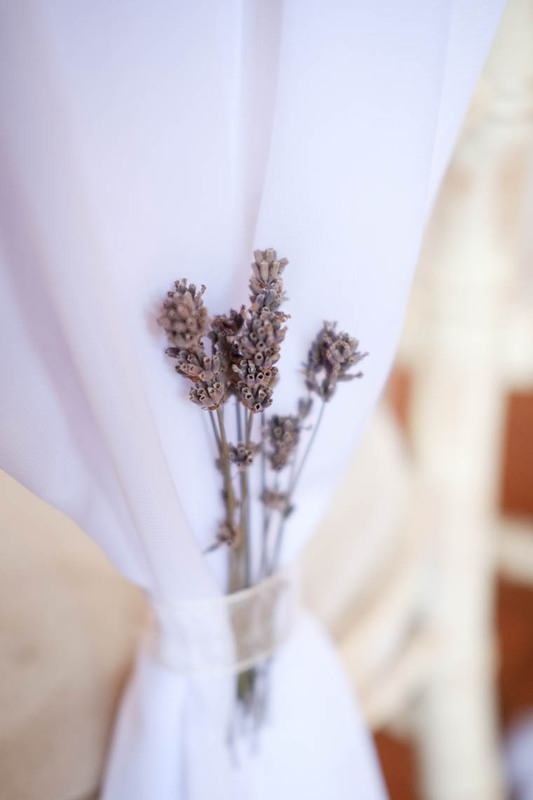 Unfortunately due to ill health, the supplier wasn’t able to provide these items in the end for the shoot. 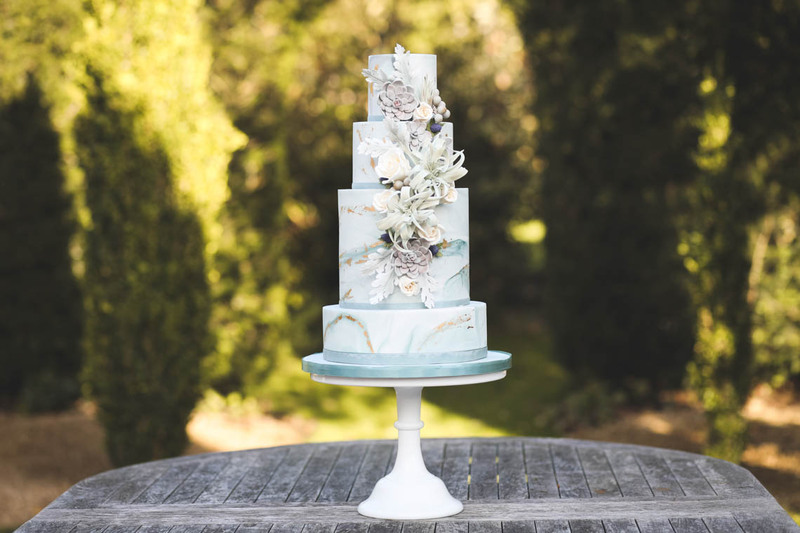 However this marble look and feel was present on other elements. 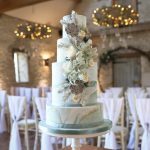 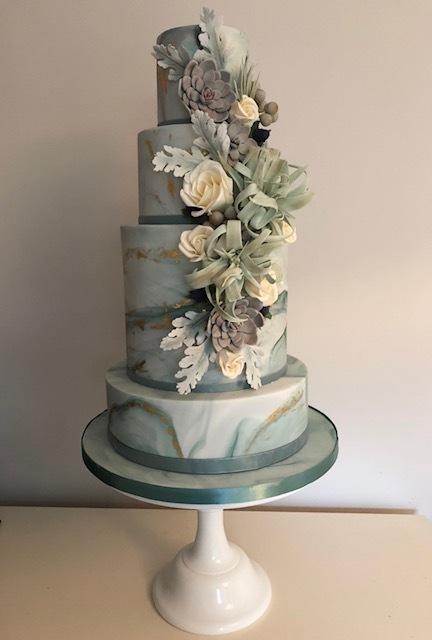 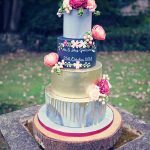 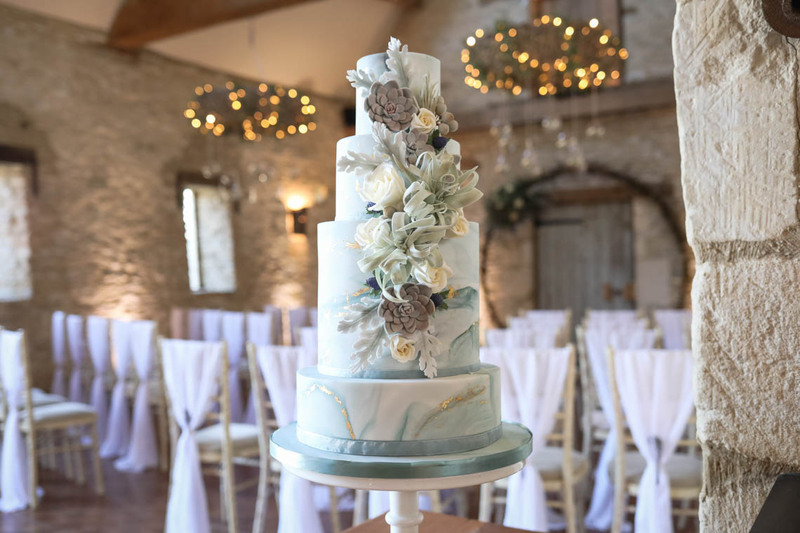 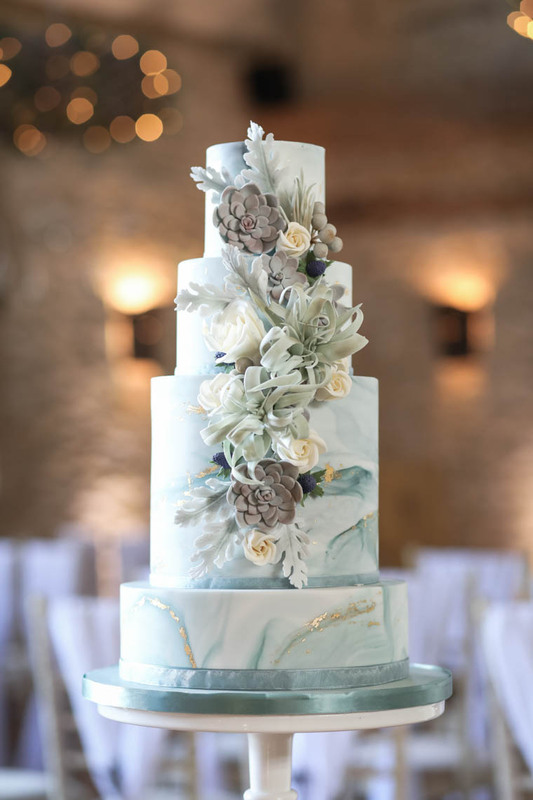 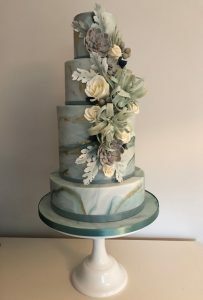 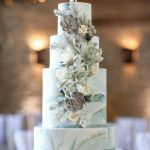 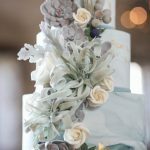 Cake design – I wasn’t sure that a Cotswold barn wedding was the right setting for a geode cake, so marble made the perfect theme for the cake. 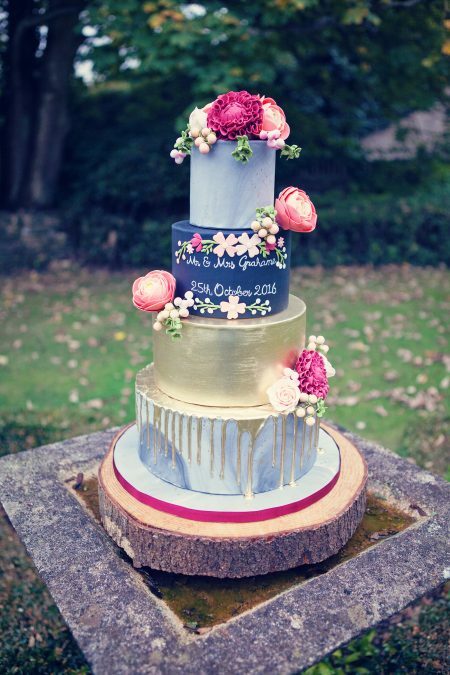 The Pretty Cake Company never fail to impress with their spectacular cakes and exquisite replica flower sugar work. 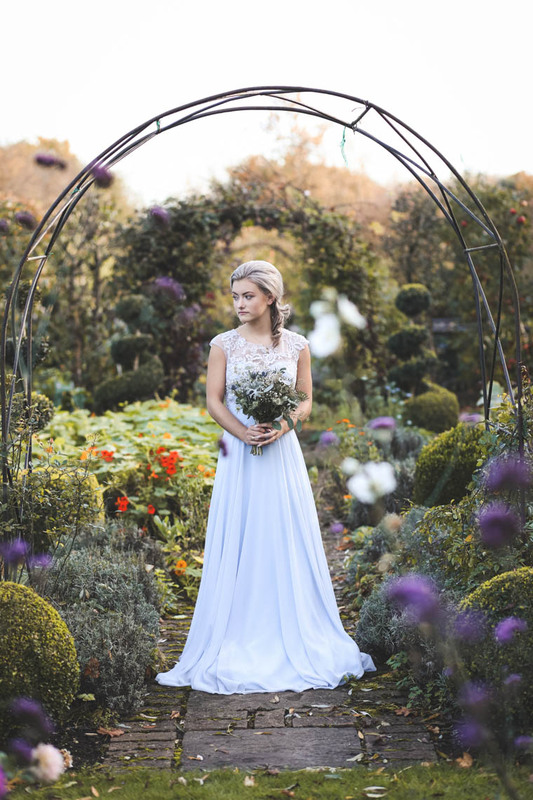 And the beauty for this shoot included 4 different tier heights and the cascade of flowers matched the real ones immaculately. 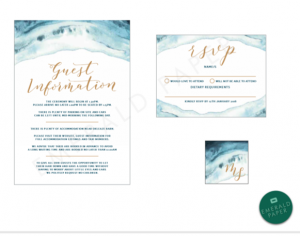 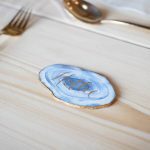 Stationery design – Continuing my quest to present novel alternatives to paper stationery, I initially was keen to utilise actual shards of agate for table numbers and place names. 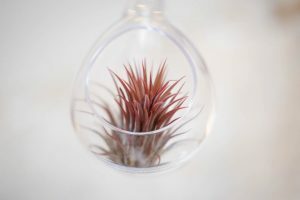 Sourcing these locally, economically and timely proved harder than first planned. 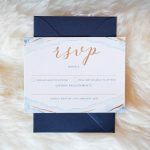 Thankfully, the incredibly talented Emerald Paper Design was able to create trompe-l’œil card replicas to give the same look and feel along with her beautiful gold calligraphy. 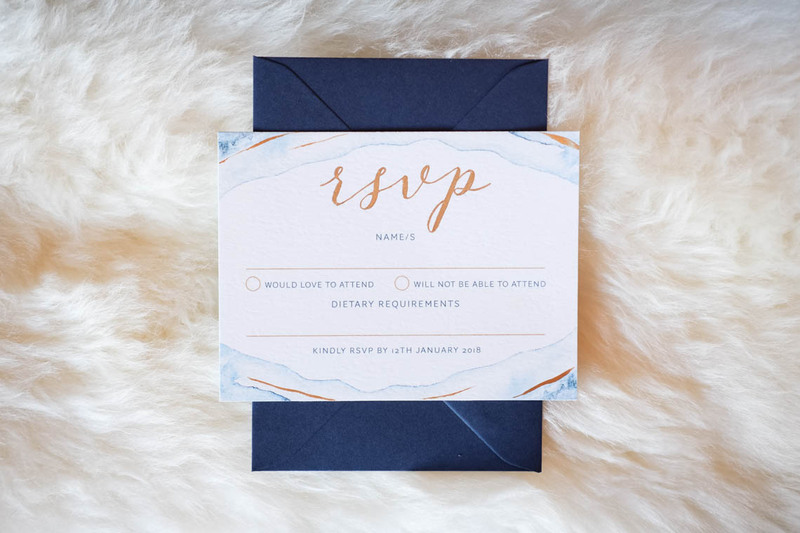 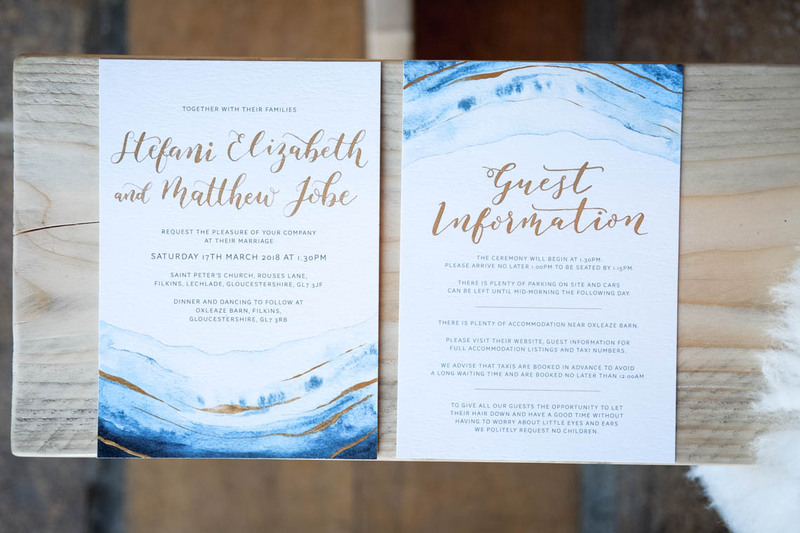 The whole suite featured geode style watercolour stationery with gold accents and a navy envelope. 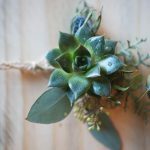 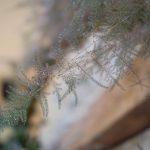 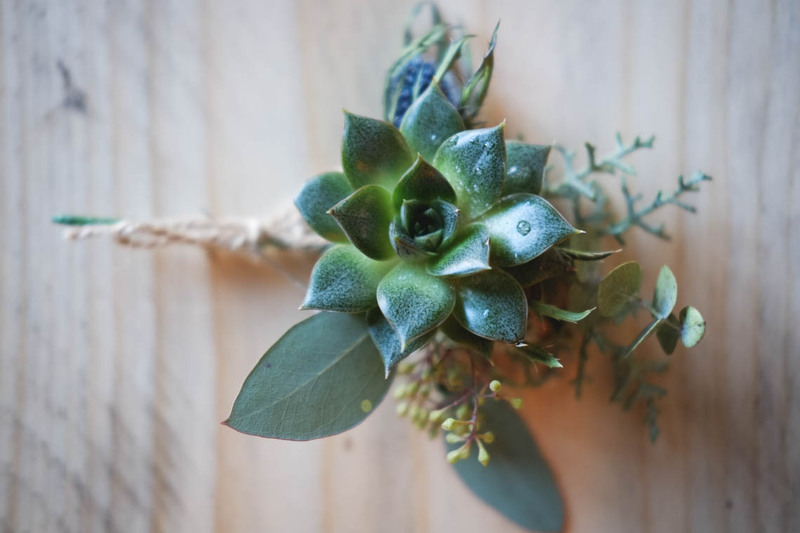 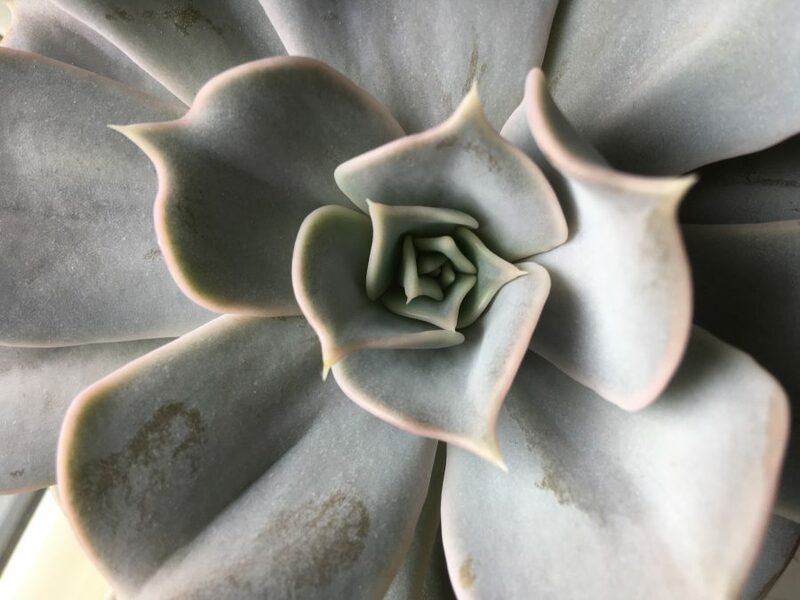 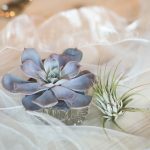 Flowers – despite my love of flowers, I’m discovering that a lot of my briefs recently have become almost ‘anti-flowers’ (ie just foliage, paper flowers, plants in pots) and this shoot focused heavily on succulents and air plants. 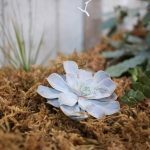 Succulents are certainly one of my own fascinations and I’ve even started to propagate some for my own terrarium at home. 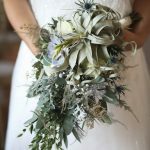 For this shoot, I wanted the bouquets to feel modern and give a contrast against all the soft tulle. 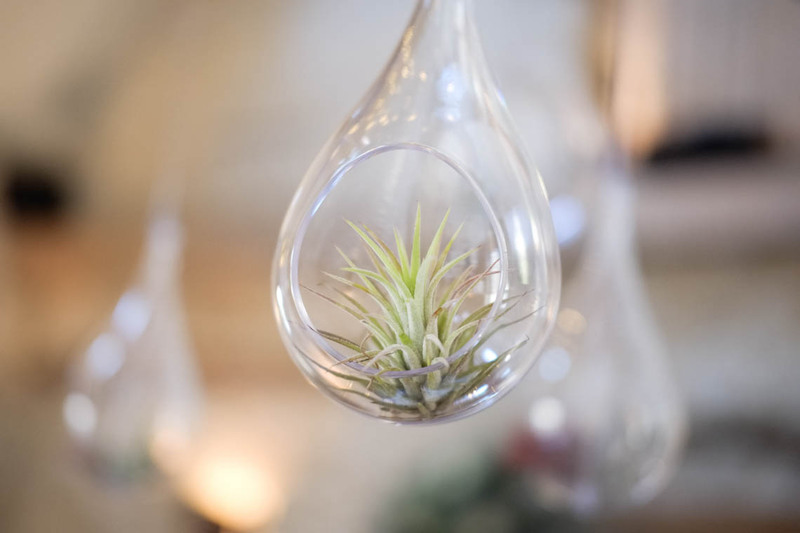 I loved the use of delicate air plants (a wonderful evolution on the succulent trend) and glass suspended baubles. 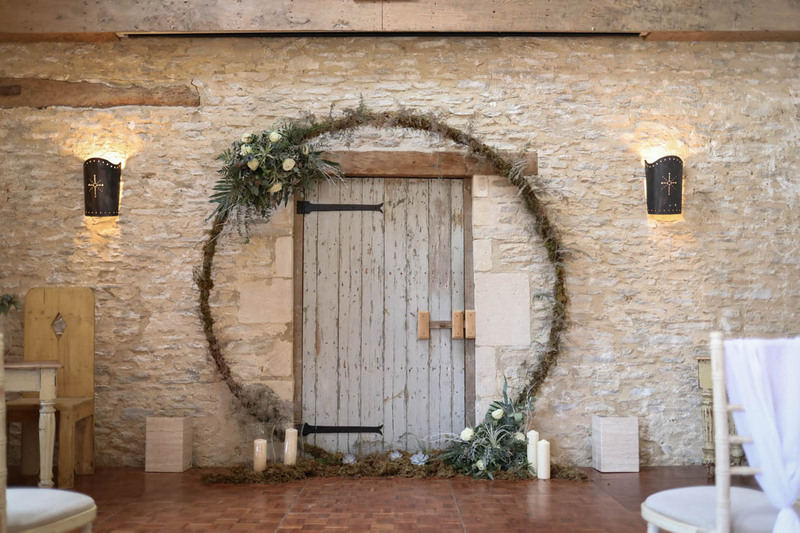 Plus Enchanted Floristry brought along their amazing moongate that helped encapsulate the sense of entering a volcanic tunnel. 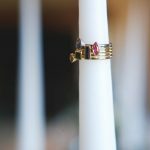 Jewellery – It was brilliant to work with We Three Kings and their pieces echoed the colours and accents incredibly. 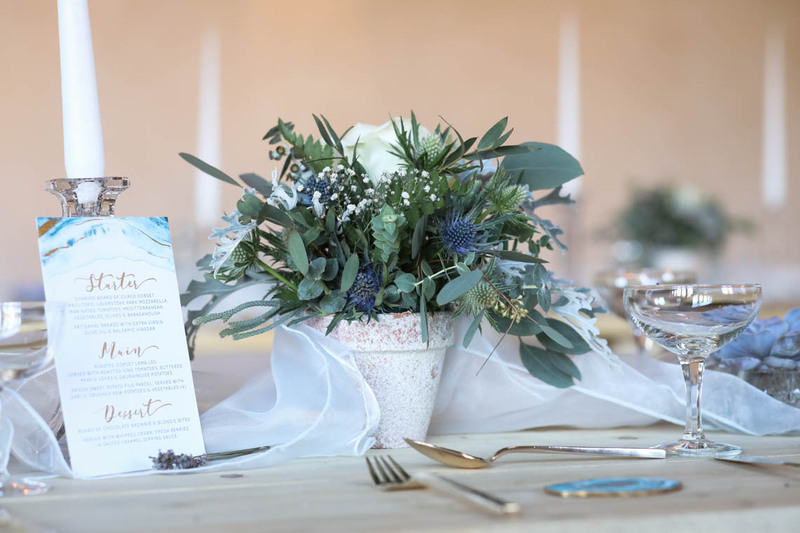 It’s the little details that bring any event to life and this was made possible by the wonderful local suppliers who provided their time, services, venue and products for free. 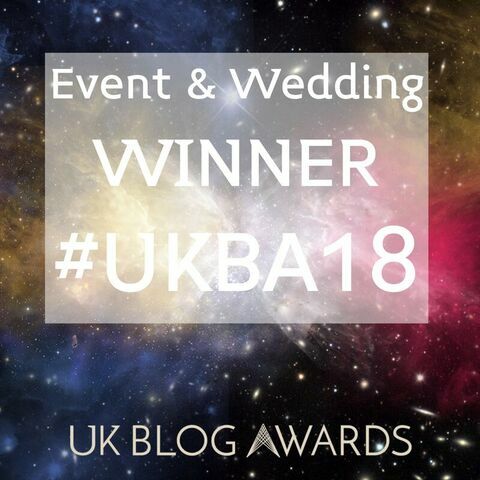 Together we showcased the amazing talent that our part of the UK has to offer the wedding industry. 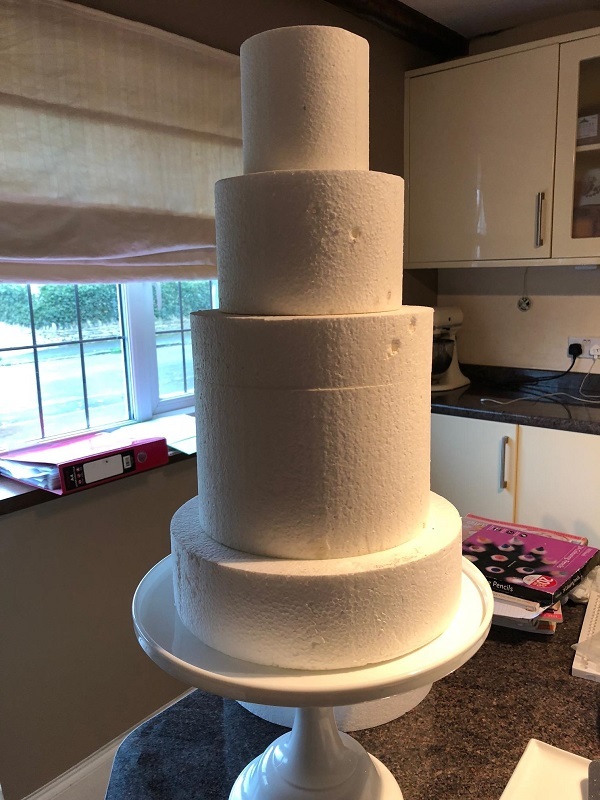 Despite the snow machine not materialising and a last minute change of models, the finished result was well worth the effort again. 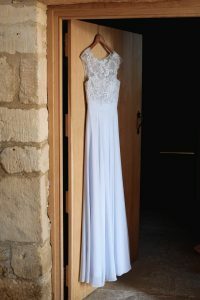 Dress – From the outset, I wanted to include a blue dress in this shoot. Ideally I wanted a bridal separate like the Sweet Caroline Norma J separates but these aren’t readily stocked in local dress supplier shops. 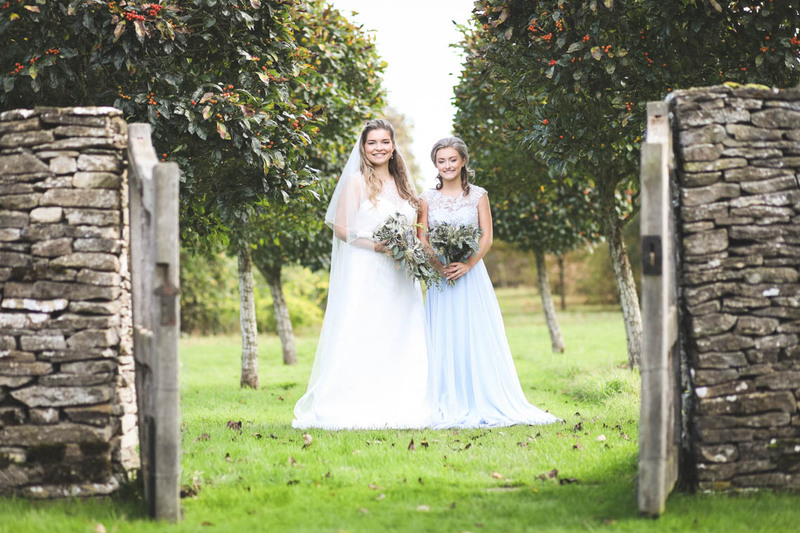 However thanks to Fairytale Occasions we were able to demonstrate a blue dress alongside a full tactile tulle white dress. 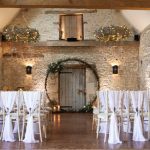 Lighting – Oakwood Events are an absolutely amazing company – friendly, reliable and highly sought after. Despite their really busy schedule, I was fortunate enough to involve their services again and showcase a brand new addition to their portfolio (which they sped through the design process especially for this shoot). 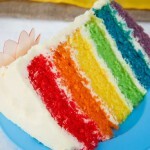 It’s like they can read my mind! And luckily they don’t think my ideas are too crazy! 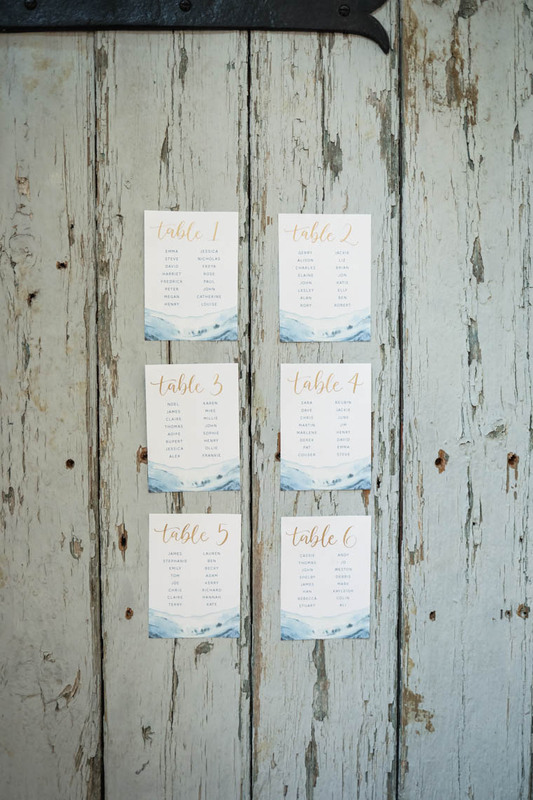 I love that these displays give an industrial feel which is a great contrast with the relaxed vibe in the room. 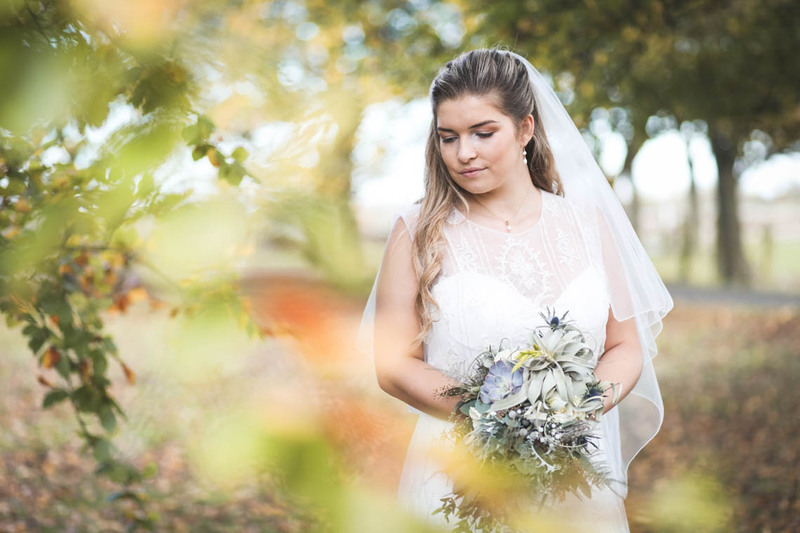 Please do get in touch, if you are a local venue, wedding supplier or photographer and are looking to collaborate on a styled bridal shoot in the future. 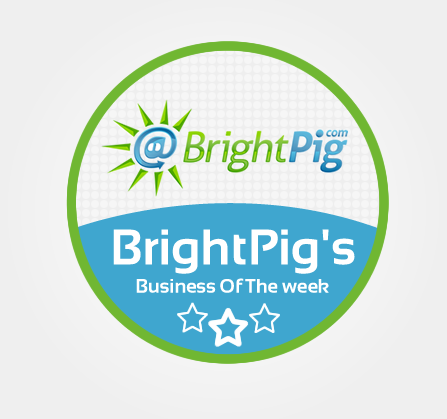 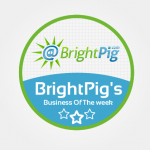 “I love working with you too as you always showcase the best of what our region has to offer! 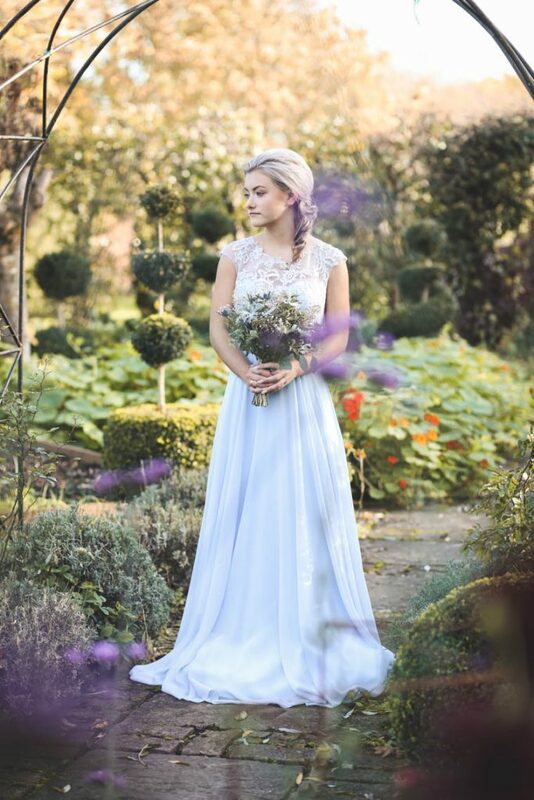 “Many thanks to you Nicola for working tirelessly and pulling [the shoot] off so successfully. 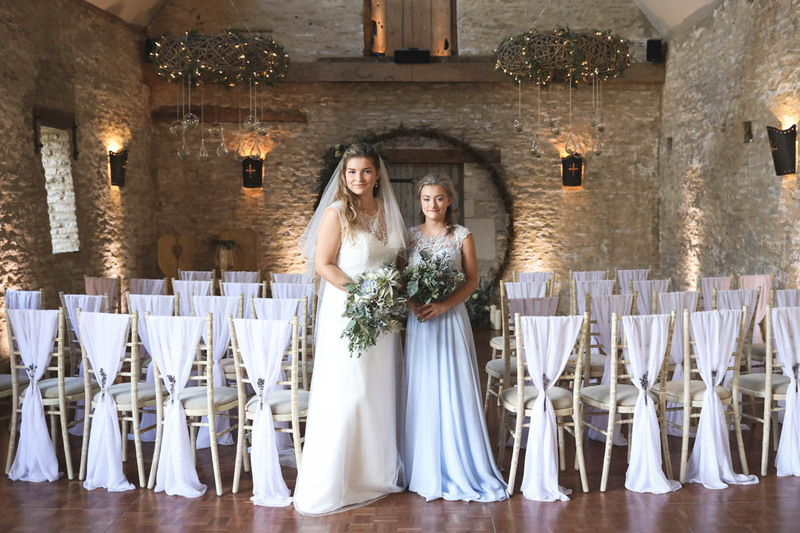 Thank you so much for all your amazing hard work on the photo shoot, we can’t wait to see the photos as the Barn looked so lovely. 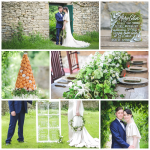 “Thank you so much for sending everything over – the images are fantastic. 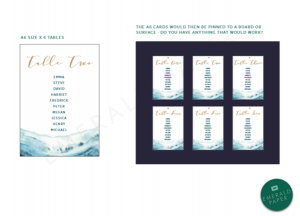 What a brilliant collaboration the shoot was and the proof is in the pudding, I’m so pleased it is being so well received. 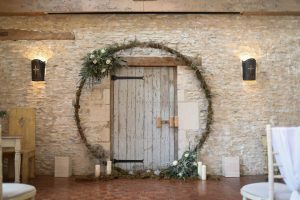 Inspired by Journey to the Centre of the Earth by Jules Verne, this modern winter barn wedding shows the stunning hidden interior of volcanic rock in the form of slick agate and timeless marble. 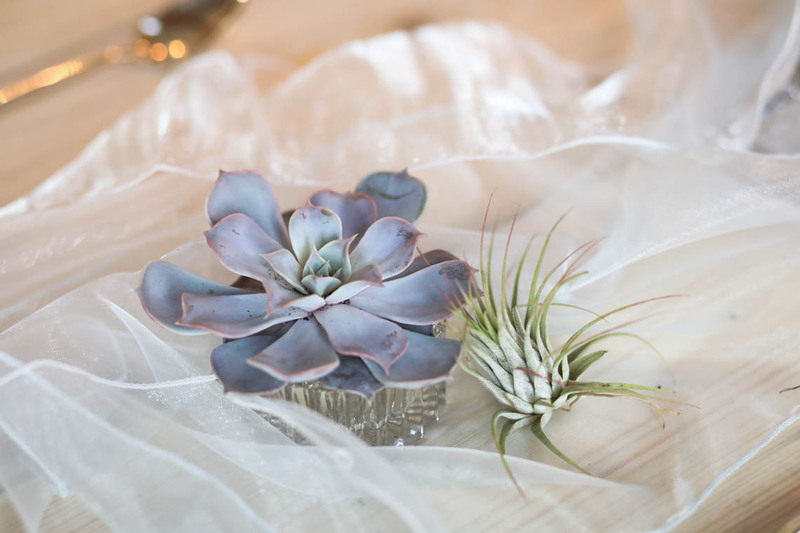 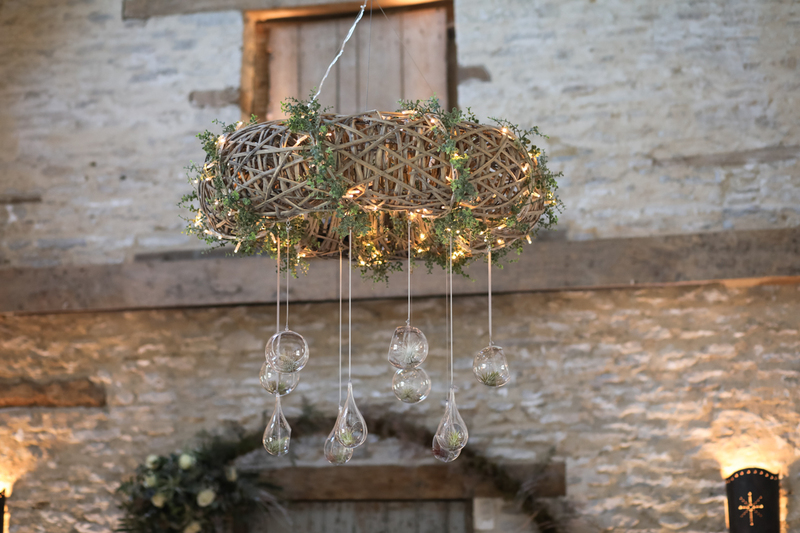 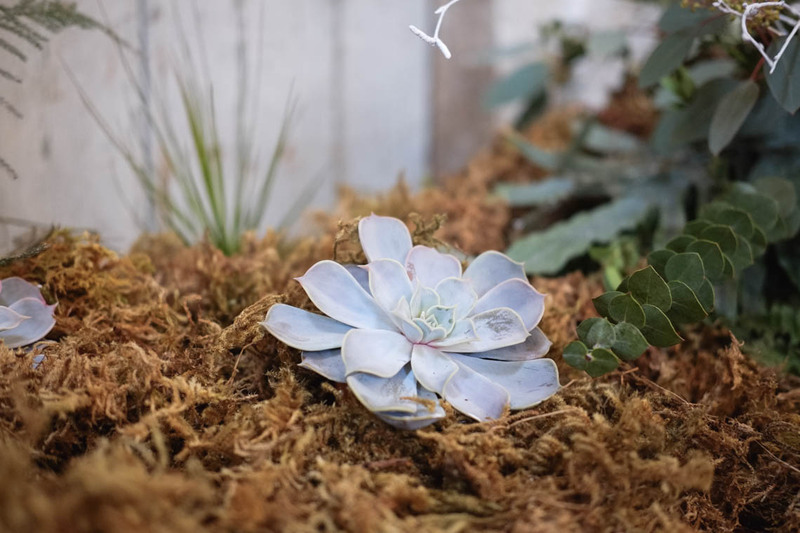 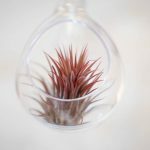 Acres of gentle, ethereal and floaty tulle were placed wonderfully alongside tactile sheep skin rugs and the tendrils of delicate air plants (a wonderful evolution on the succulent trend) in glass suspended baubles. 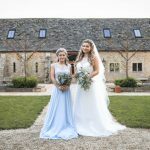 I’m Steven, a full time professional photographer who set up Squib Photography in 2002 and is lucky enough to photograph some beautiful weddings in the Oxfordshire and the Cotswolds. I also cover pretty much the rest of the UK and have even been lucky enough to be booked to cover some destinations recently overseas. 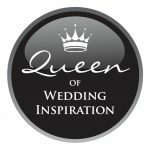 After completing my studies at Oxford Brookes University I started Squib Photography and have photographed in excess of 450 weddings to date. 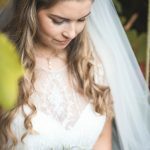 I like to provide a professional, yet flexible service offering a mixture of formal and reportage photography to perfectly capture the atmosphere of a wedding day. 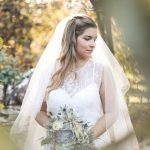 Every wedding is important to me and I will strive to tell the story of the day using natural light and little posing as possible. 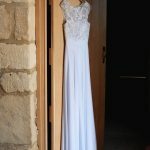 I do so in a relaxed, informal way so the couple can enjoy those special moments and leave me to document that for them. 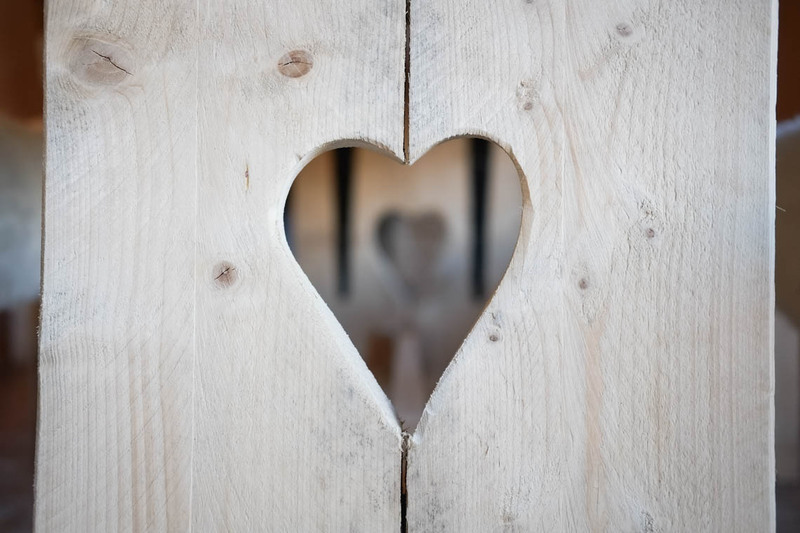 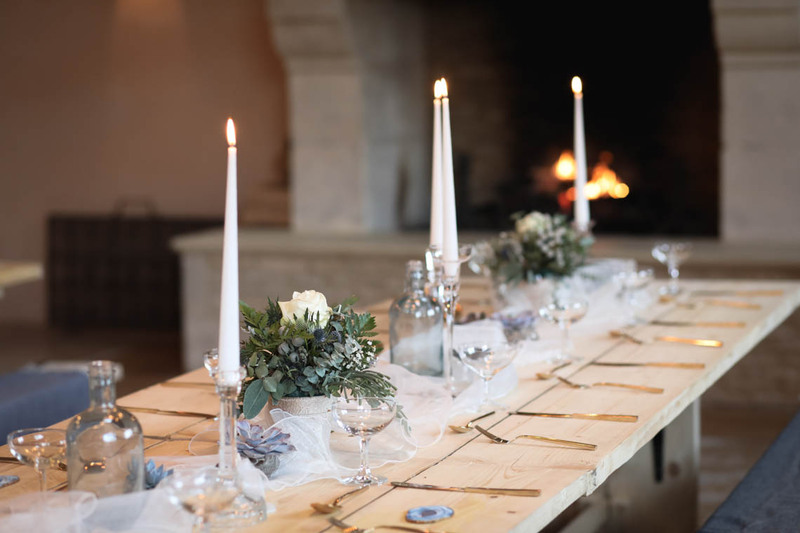 I am always open to new ideas, input from couples and understand that every wedding day is very different, so will always work carefully with them to make sure you receive a personalized, bespoke service. 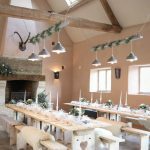 At Oxleaze Barn we endeavour to offer a venue and service that is relaxed, friendly and flexible. 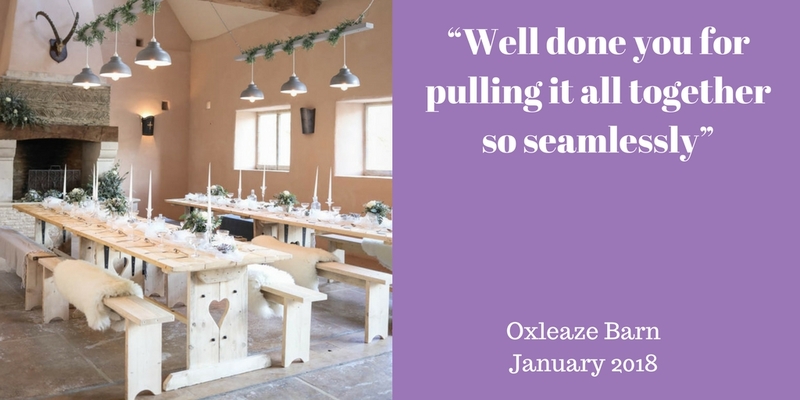 Oxleaze is a family run business located on a working farm surrounded by Cotswold countryside. 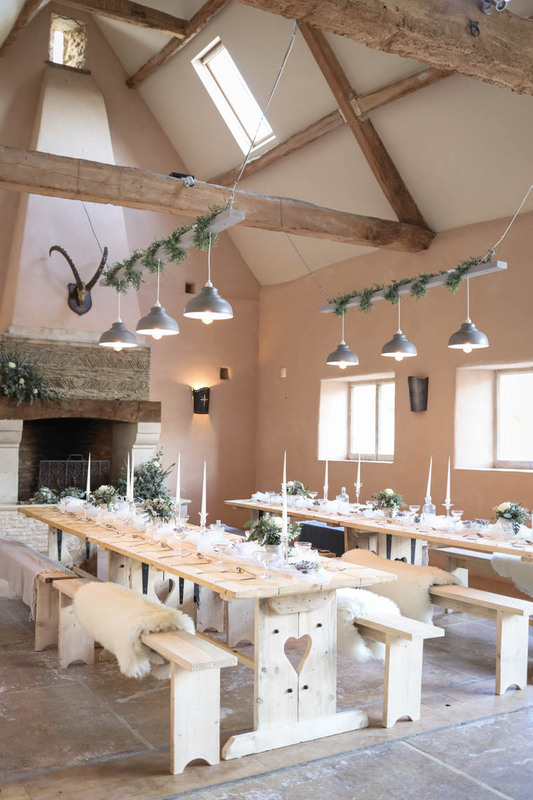 The Barn is a beautifully renovated grain store dating back to 1702. Whilst we have maintained its original features which give it such rustic charm, we have adapted it to run as an efficient event space. 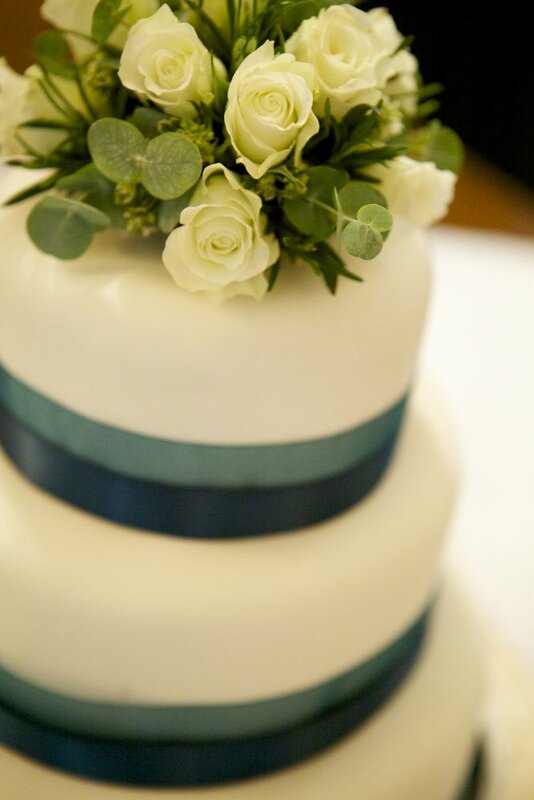 We only have one wedding a weekend to ensure you have the time to decorate and enjoy your day without feeling rushed. 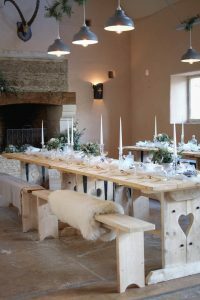 The Watering Hole manage the bar exclusively and can offer a variety of drinks packages and a cash bar to suit your requirements. 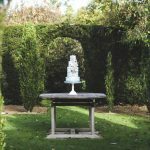 We have a list of recommended suppliers with whom we work closely, but you are not obliged to use them, and can choose your own caterer. 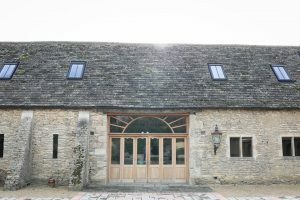 Oxleaze Barn comprises of The Barn and The Milling Barn. 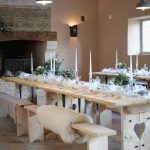 The ceremony and the wedding breakfast take place in The Barn. 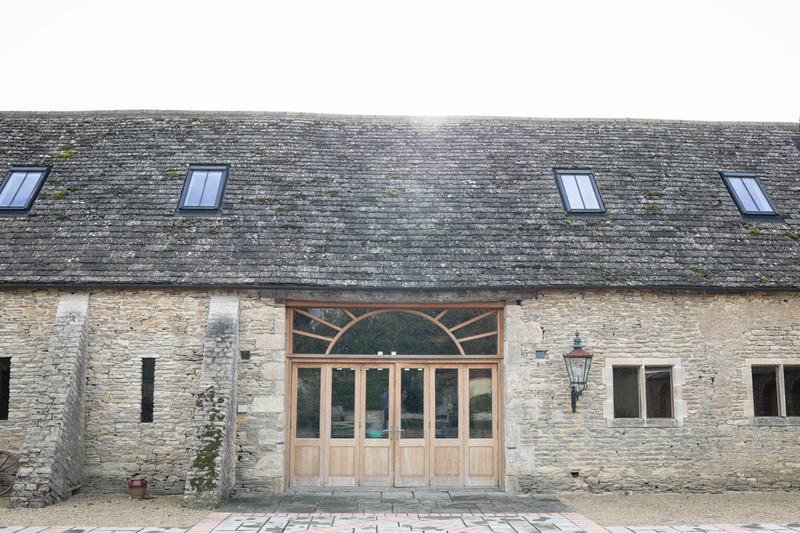 The Milling Barn is available for the drinks reception and dancing. 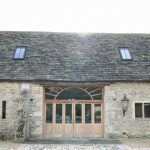 The Barn opens onto a stunning landscaped courtyard and fire pit, with a wide garden gate available for late night street food vans. 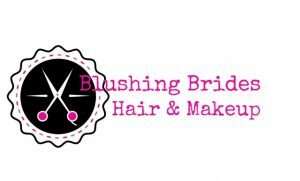 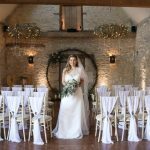 Blushing Brides Hair and Makeup, Hair and Makeup Artists are based in Oxfordshire and the Cotswolds. 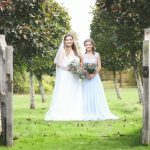 With Blushing Brides you make one booking and get two artists working for you, two artists with individual skills, ideas and experience. 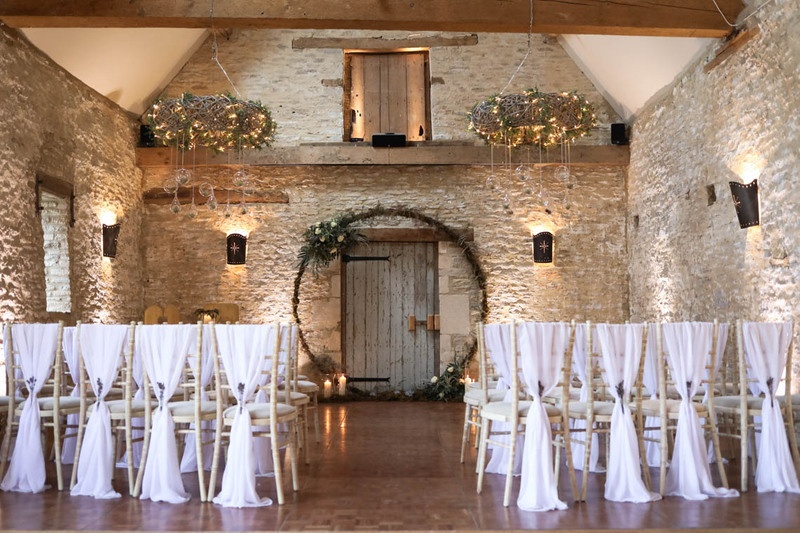 We are firm believers that with specialists who have honed their individual skills over many years you get a superior experience, the look you have always wanted and better value for money. 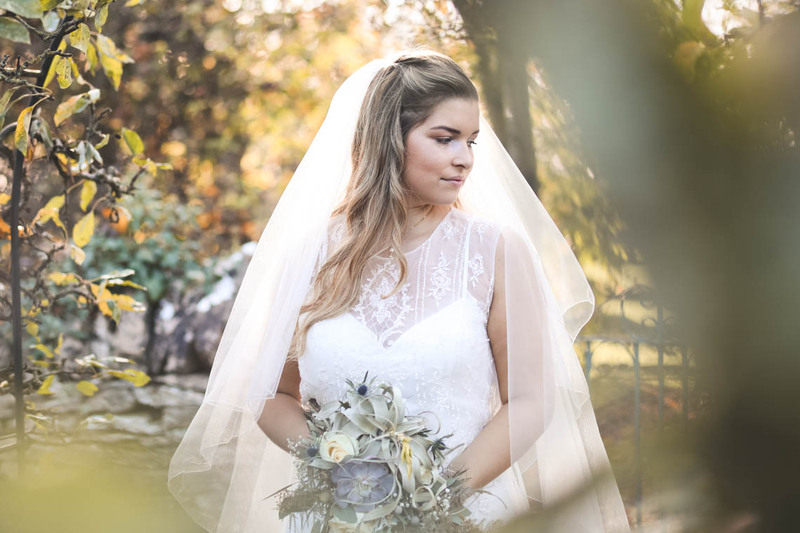 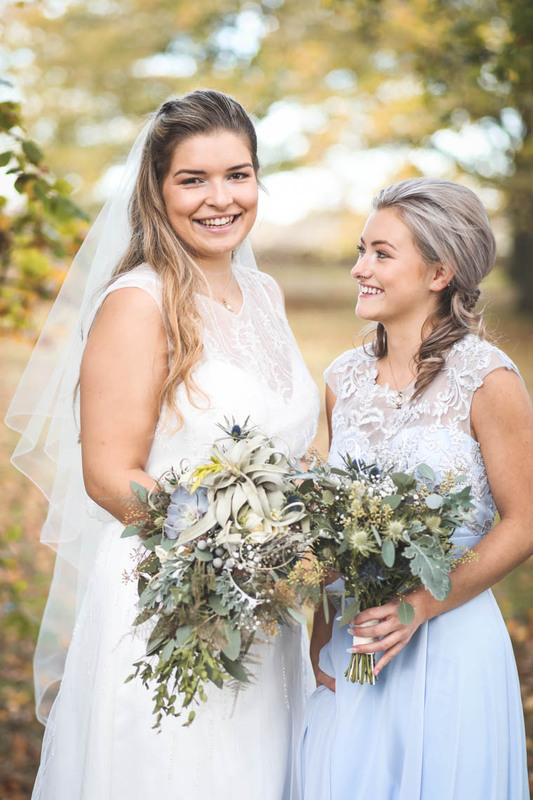 Lauren (Makeup Artist) and Laura (Hair Stylist) have many years experience working for brides and bridal parties, we bring all this to help you achieve the most beautiful look for your special day. 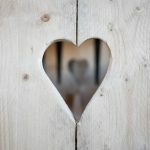 Far better, we believe, than one person pushing themselves to do both. 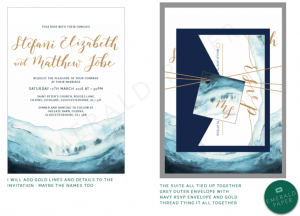 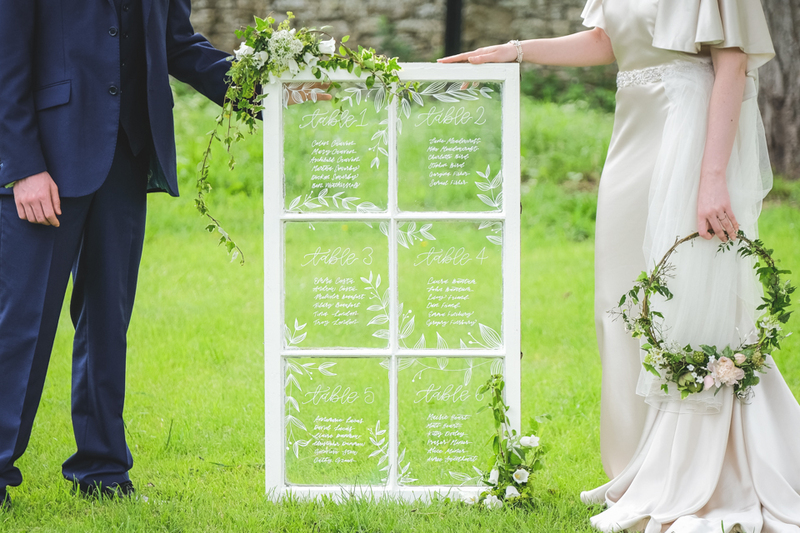 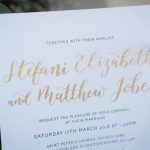 Emerald Paper Design is a wedding stationery and modern calligraphy studio based in Cheltenham, UK. 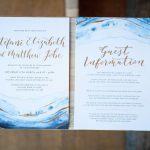 We specialise in bespoke watercolours, illustrations and calligraphy to create stationery you and your guests will love. 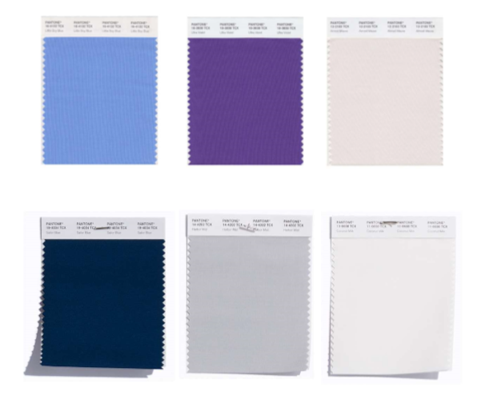 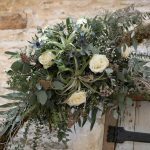 Whether you are looking for something modern, something floral, or something completely different, we can help create something with an individual touch. 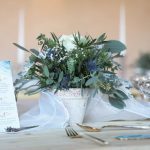 Enchanted Floristry is an innovative, bespoke high quality floral designer. 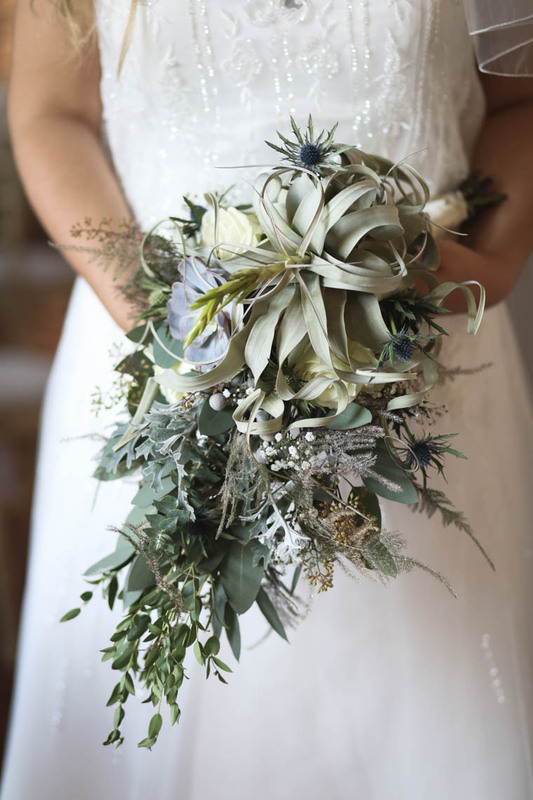 Highly talented, incredibly passionate and driven by a complete love of flowers. 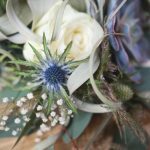 Along with training by top floristry schools and an impressive array of qualifications, is her eye for detail and creative new ideas. 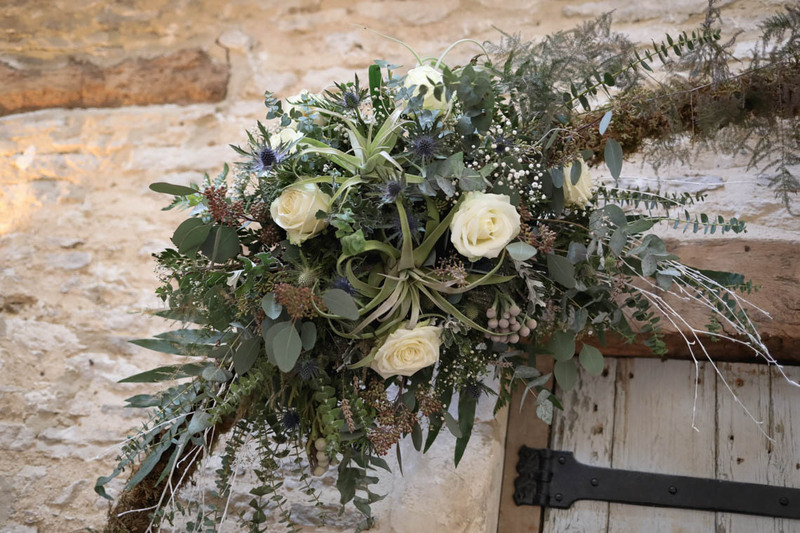 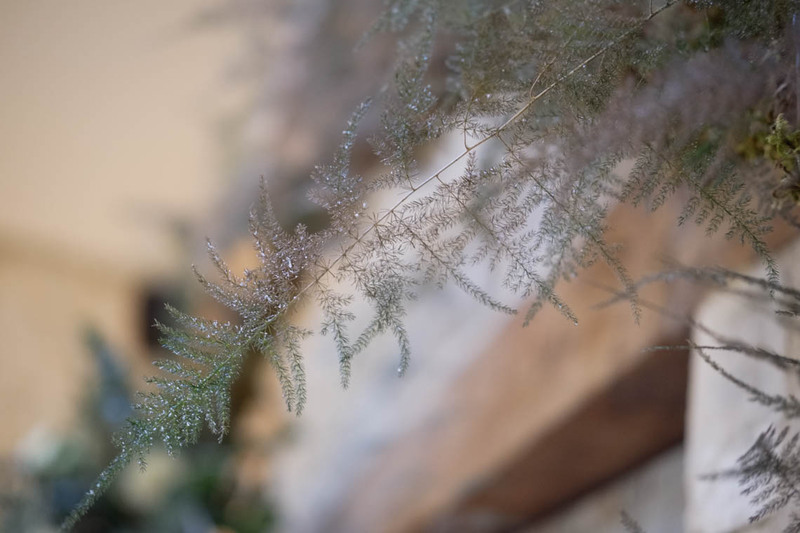 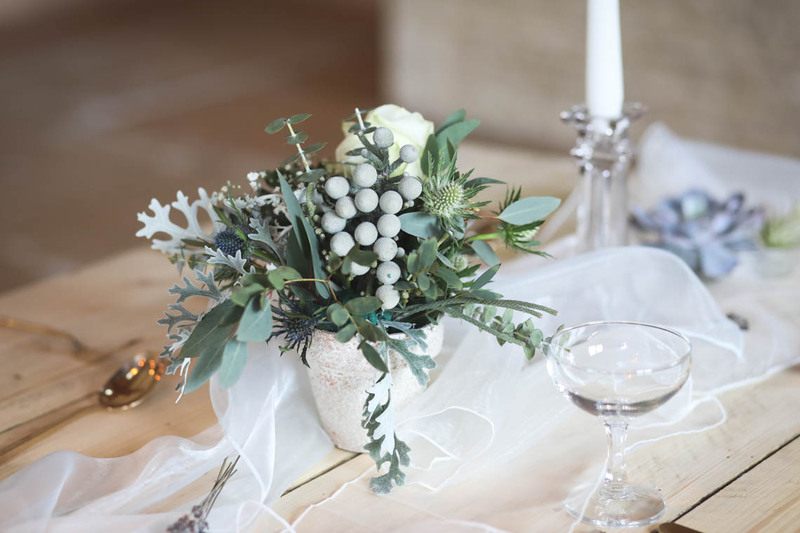 Operating out of a beautiful Shepherd’s hut and workshop in rural Oxfordshire, Enchanted Floristry creates and produces incredible customised floral designs with the WOW factor for weddings. 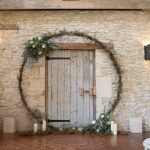 Their impressive moongate, a freestanding 2 metre high wreath, provides a spectacular backdrop for your ceremony and can be dressed to suit the theme, season and colours of your wedding. 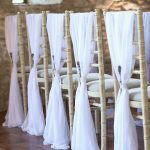 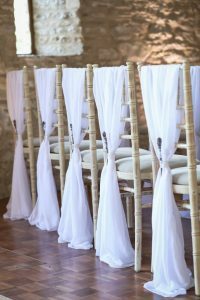 Chiffon Vertical Drops for Chivari chairs and Organza Table Runners. 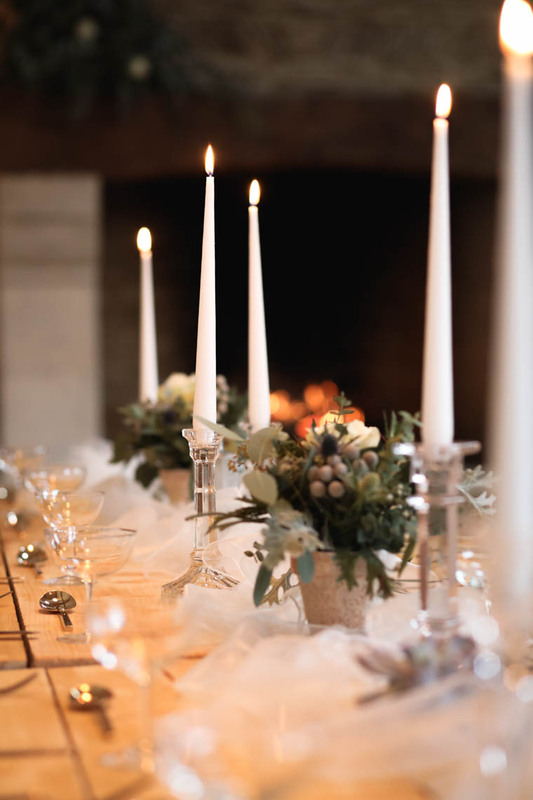 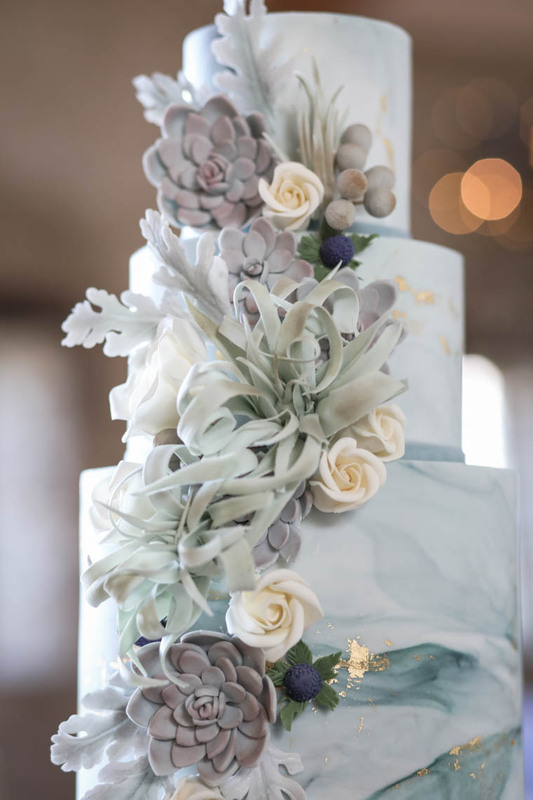 Ellie Tanner is a venue stylist who started out in the industry in 2005 with chocolate fountains and soon found her passion for beautiful wedding decor. 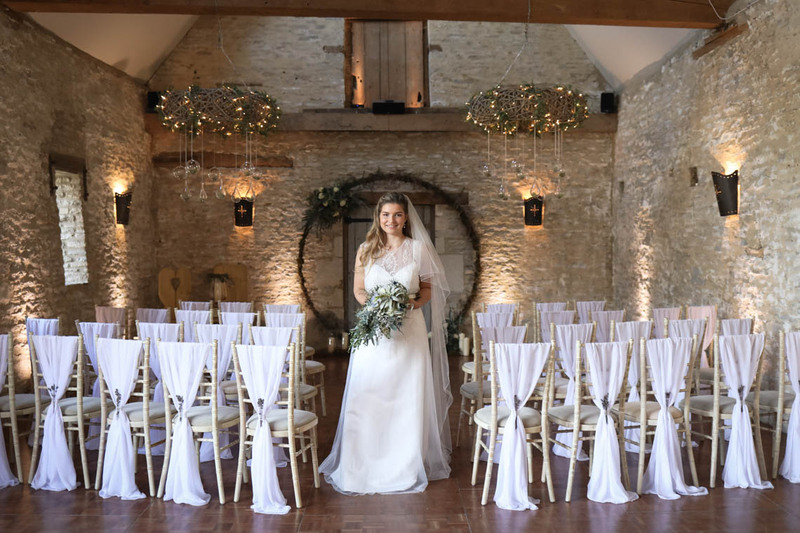 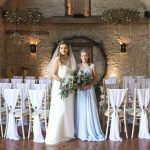 She has built up many years of experience working with many various venues around the South West, transforming venues into memorable and stunning weddings and providing excellent customer service to couples. 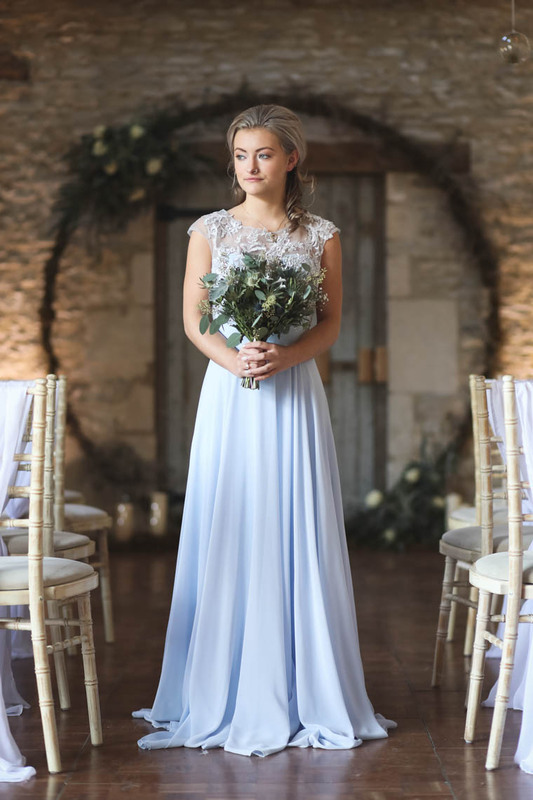 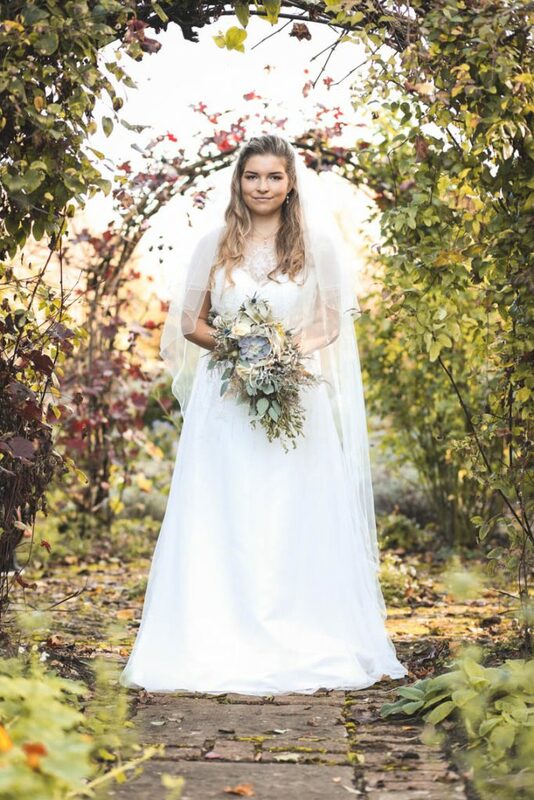 Our quaint little bridal boutique is based in Highworth, Swindon, Wiltshire and we currently stock designer wedding dresses, prom dresses & a full accessory collection. 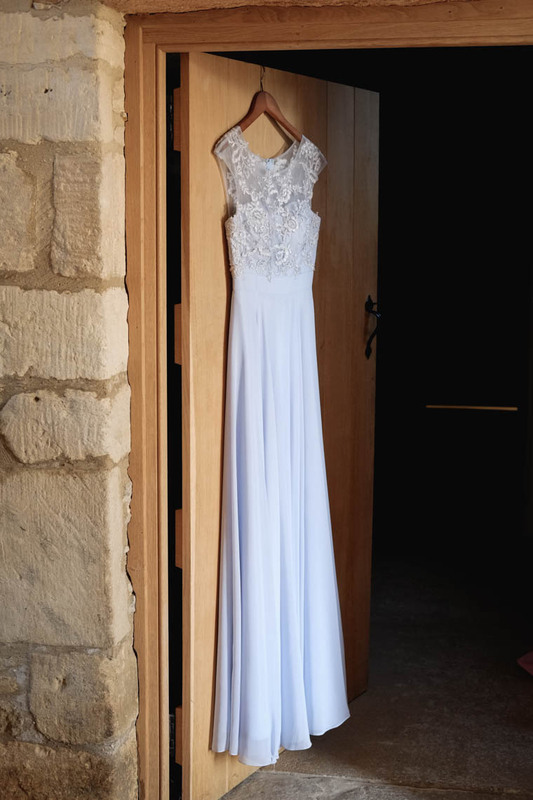 We aim to make the whole experience of finding and purchasing your dream dress relaxed and stress free, whether it be a wedding or prom dress. 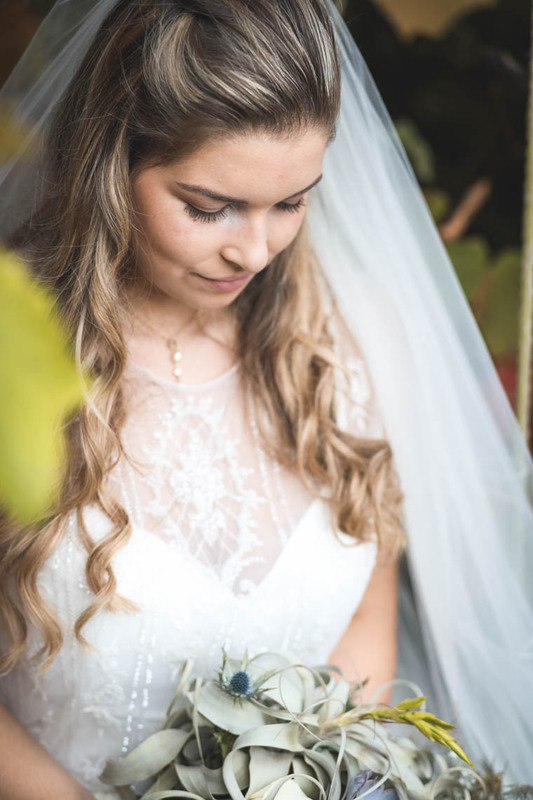 We offer a friendly service in a relaxed atmosphere for all our customers and operate an appointment system to ensure that everyone receives an exclusive one-to-one service to help build your dream look. 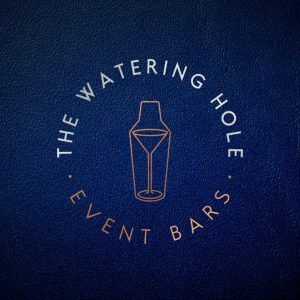 The Watering Hole Events offers a range of superb mobile bars, including the latest edition – the ‘Edison Light’ bar – creating the perfect atmosphere for any event. 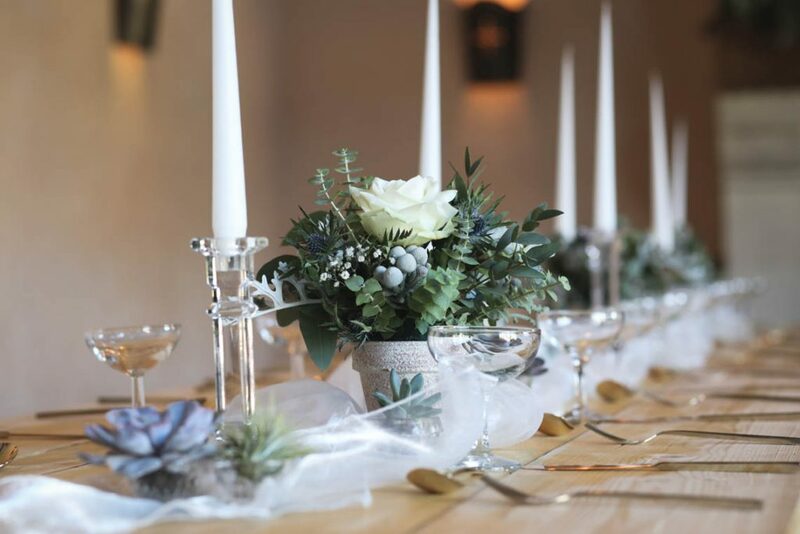 We have a wealth of experience in the industry, with our event cocktail bars and staff attending a multitude of functions, including: weddings, corporate functions, and milestone birthday parties all across the UK – particularly focussed around Worcestershire, Gloucestershire, Warwickshire and Birmingham. 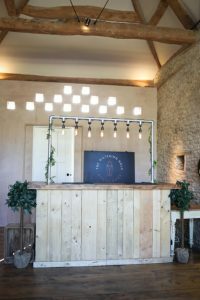 A range of your favourite cocktails can be chosen, along with real ales, cider and lager on tap. We can also arrange your daytime drinks package, which includes welcome drinks as your guests arrive, a toast drink and table wine, chilled and served, until the evening cash or free-bar opens. 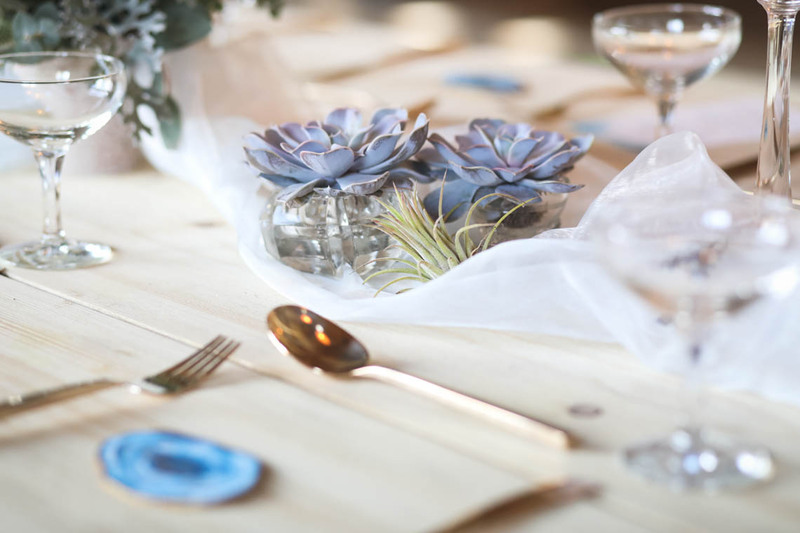 Our event teams recycle all bar waste, from glass bottles to plastic cups, at every event. 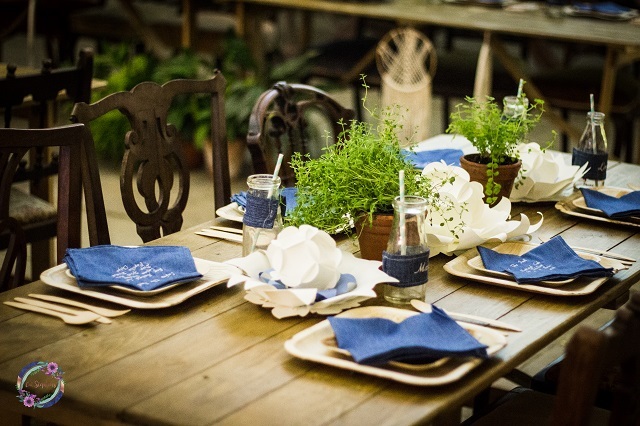 So you can continue to enjoy your party with a “green” conscience. 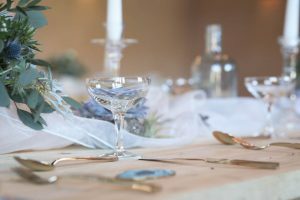 Every event is unique, exclusive and exciting, so we believe that every bar service should reflect just that! 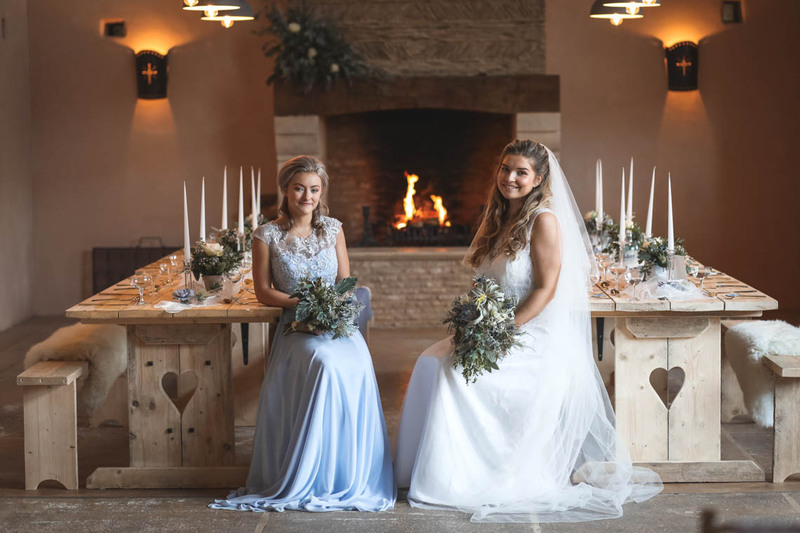 We Three Kings was established by Bill and Nicola Maddocksin 1995 and is situated in a 17th Century listed building in the Cotswold market town of Witney, Oxfordshire. 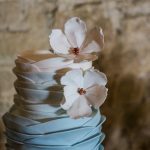 The gallery workshop in Bridge Street is where Bill and Nicola Maddocks design and make beautiful pieces of jewellery at the bench. 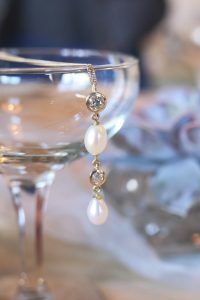 They offer a specialist jewellery service, their bespoke designs allow them to tailor the design and materials to suit your style and budget. 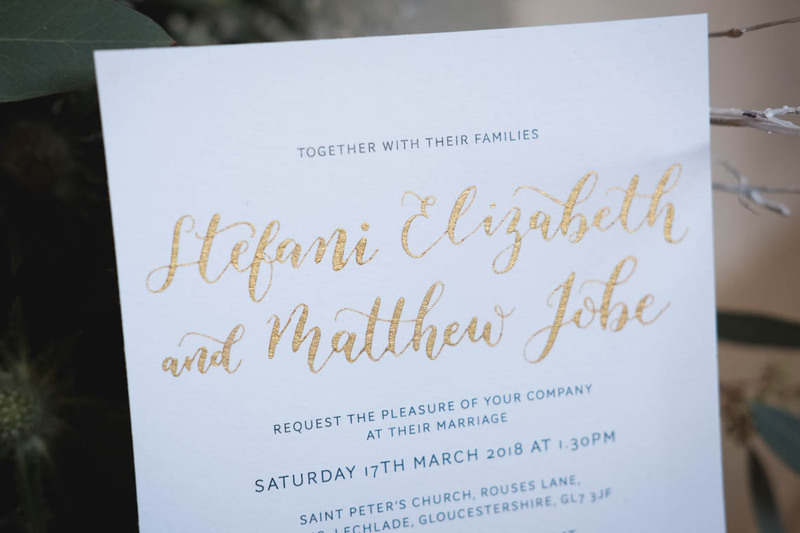 Working closely with other specialist trades enables them to offer hand engraving and an assortment of other services including CAD, casting, plating and stone cutting of the highest quality. 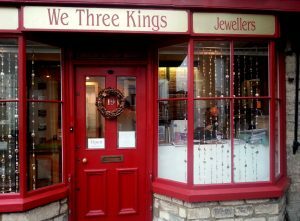 We Three Kings also offer to service and repair your jewellery whether it is a general check-up or complete overhaul. 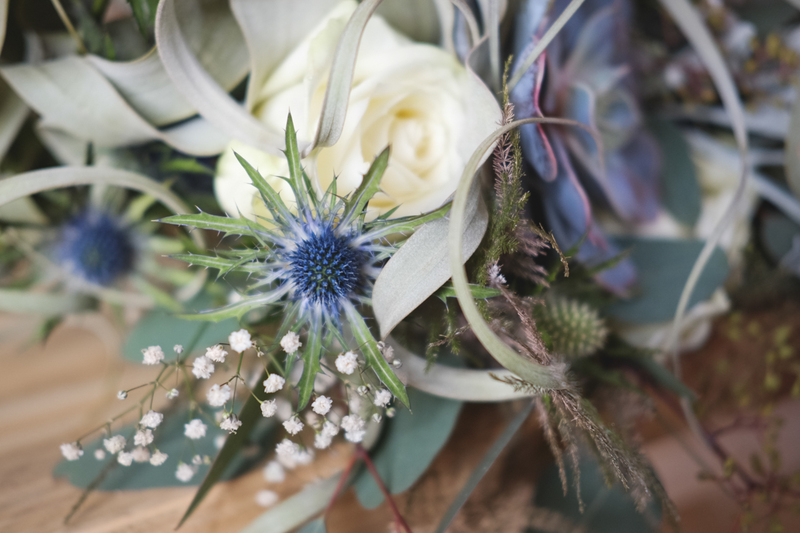 Bill is a goldsmith working in residence within the gallery and is happy to discuss design ideas. 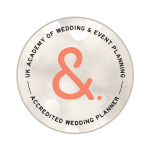 Appointments are free and you are not committing yourself until you are happy with the design and the price. 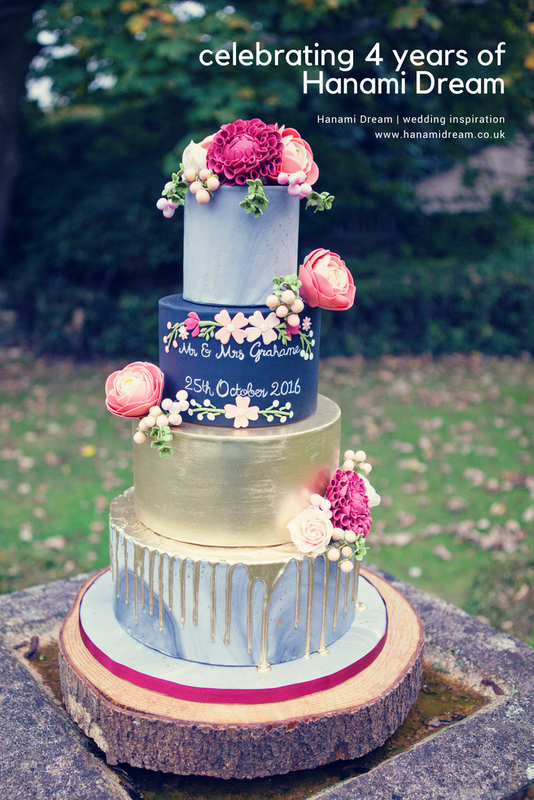 After that a deposit is required if you decide to have the piece made up. 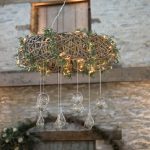 It takes approximately six to eight weeks after designing to create the finished piece. 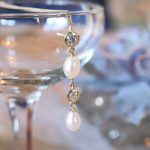 They work in gold, silver and platinum and can source practically any stones you require from the highest quality diamonds to semi-precious stones and beads. It is also possible to remodel existing pieces of jewellery. 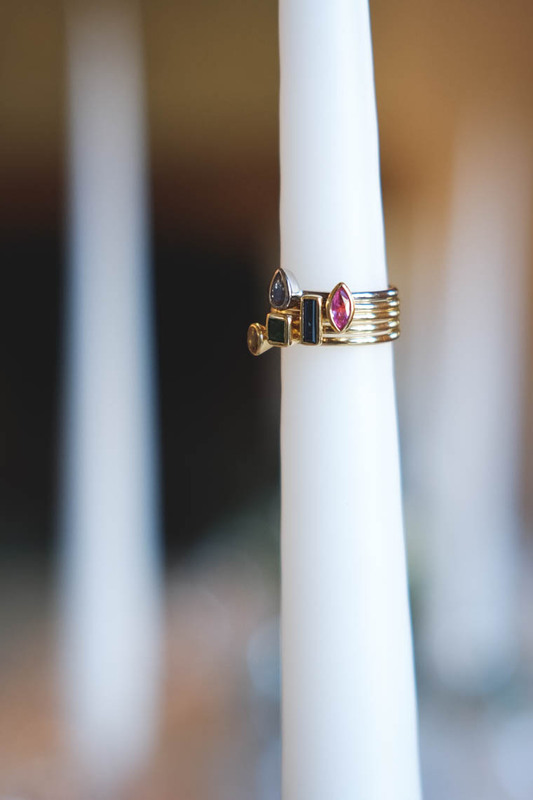 Bill can melt and reuse old gold if it has a sentimental value and old stones can be cleaned and reused to create a new unique piece. 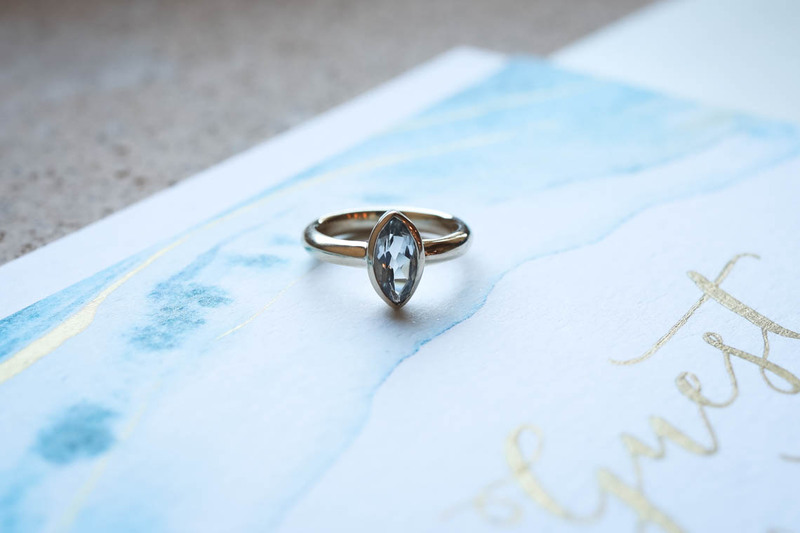 They make jewellery for all types of occasions and appreciate it can sometimes be difficult for customers to be confident when having a piece made as a surprise so they offer a service where you can present a sketch in a box allowing the design and materials to evolve so the final piece is exactly what you want. 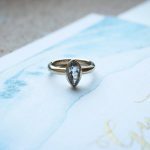 Another option is to choose a stone which can be given in a presentation box and you can come in and design the piece together. Take a look at a behind the scenes look at the briefs that were given to these fabulous suppliers and how the Journey to the Centre of the Earth theme came to life with their designs and products.